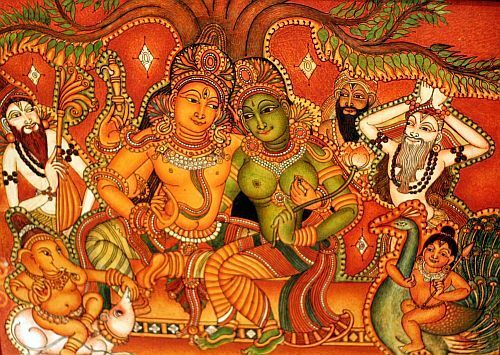 In this article we move on to the 20th and 21st century and admire the sublime paintings of Shri S Rajam, perhaps the sole votary of Chitrasutra tradition in the modern times. The present article briefly outlines Shri S Rajam’s achievements in the field of music and in the music related arts. 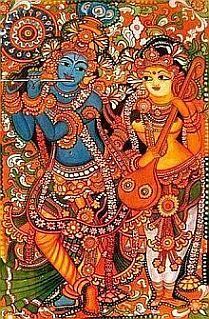 1.1 Sangita Kalacharya Vidvan Shri S Rajam is a many splendored jewel of Indian art and music. He is the musicians’ musician; held in very high esteem by the connoisseurs of Carnatic music; he is the creator of sublime art in the pristine and ancient tradition of Chitrasutra; he is an excellent photographer who produced outstanding photographs of temple architecture and sculptures; and, in his youth a hero of early South Indian films who composed songs and sung them too. The most amazing aspect of his involvement in several branches of arts is that he excelled in each of them; created a unique niche of his own; and , yet remained unaffected by his success. And, above all , he is a remarkable human being with a flame-like imagination ; and, a teacher with an understanding heart. He is often, aptly, described as a simple man of singular achievements in a plurality of fields. It is hard to cite anyone, in the contemporary world, as comparable to Shri S Rajam. He is a rare gem; and, like any precious gem he is away from public gaze. 1.2. Even as he is mellowing sweetly into his nineties, he retains the sense of wonder and awe at the marvels of life. He continues to work with zeal, regularly, at his art; and says with a child-like delight : he is discovering and learning a few new things each day. As regarded music, his other passion in life, he is active as a teacher and as a guide; and participates in academia and in the discussions at various Sabhas . [ Sad to say that about two years after this article was posted, Shri Rajam passed away at the age of 91 , on 29 Jan 2010 . Please click here . 1.3. 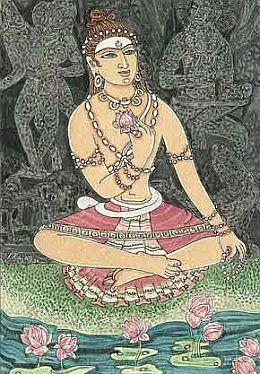 I have special regard, appreciation and reverence towards Shri S Rajam; because I view him as one of the few gifted artists of the twentieth century who breathed fresh life into the ancient tradition of Chitrasutra – not by talking or writing about the ancient art but by diligently practicing it with devotion and sincerity , over a long period of more than sixty years. 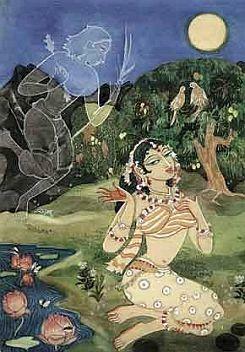 My admiration of him is heightened because he is perhaps the sole true representative and votary of the Chitrasutra in the modern era. To use a favorite phrase of Sri Shankara-bhagavatpada , Shri S Rajam is a Sampradaya-vit, the one who understands Sampradaya the good tradition. 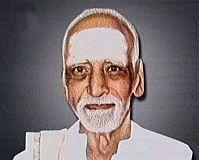 Shri S Rajam pointed out, “In tradition, only good things should remain; the bad should be ignored and not continued. This is tradition”. And he also said, “Be modern in outlook; there is no problem with that. But, learn to appreciate the beauty and elegance of your culture. Safeguard it; develop it; and, carry it forward for the benefit of the next generation “. 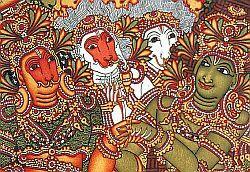 The present article aims, mainly, to talk about that aspect of Shri Rajam’s artistic genius. 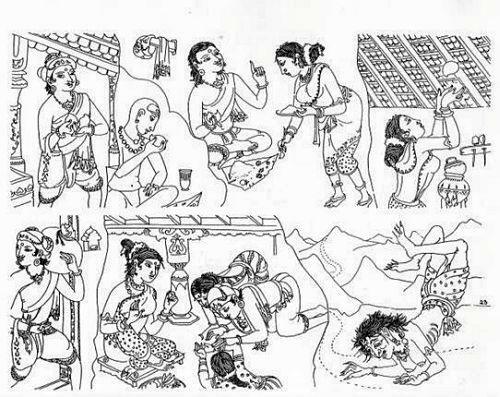 But, before we resume discussion on Shri Rajam as an artist, let’s take a quick glance at a few of his life-events and his achievements. 2.1. S Rajam was born at Madurai on 10.02.1919 to Smt. 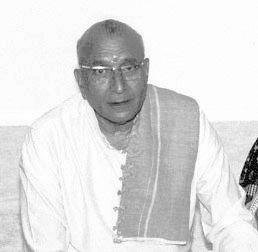 Parvathiamma (also called Chellammal) and Sri V Sundaram Ayyar, a leading advocate of Madras. 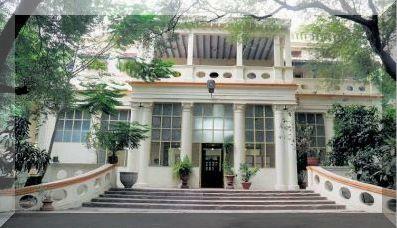 Sundaram Ayyar was a scholar, a person of culture and a lover of Carnatic music. He, as a connoisseur and patron of music, wrote music-reviews for ‘The Hindu‘; and , his views were respected by artistes such as Ariyakkudi Ramanuja Iyengar and others. S Rajam later in his life recalled, “In case my father felt that a particular sangati was out of place, Iyengar would drop it”. It is said; at the suggestion of Sri Pudukkottai Dakshinamoorthi Pillai (1875 – 1925), a noted mridangam and khanjira vidwan of those times, Sundaram Ayyar constructed a spacious hall on the first floor of his house at Mylapore , in order to hold the concerts of the musicians he admired, such as Ariyakudi Ramanujam Iyengar, Madurai Mani, Ambi Deekshithar, Muthiah Bagavathar and Karaikudi Sambasivam. 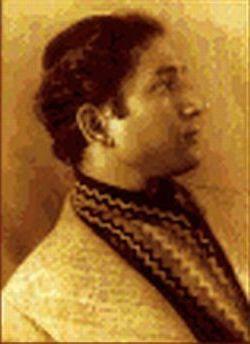 Sundaram Ayyar, it is said, supported and sponsored a young and talented musician Ramaiya who had come to Madras in search of a career in music. Ramaiya later flowered and flourished as a noted singer and a composer of great merit; and gained fame as Papanasanam Sivan (1890 – 1973). 2.3. 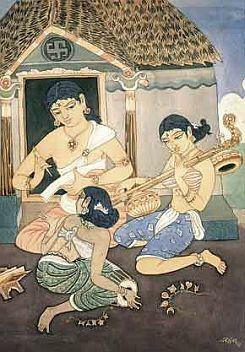 Rajam had his music training at a very young age. 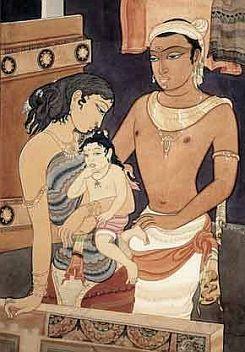 Sundaram Ayyar had engaged Ramaiya (Papanasanam Sivan) to train Rajam and his sister Jayalakshmi. 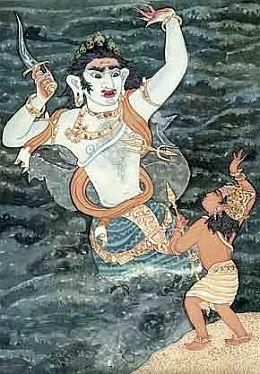 Rajam was thus among the earliest disciples of Papanasanam Sivan. The talented disciple performed as early as in his 13th year. Rajam who was then in P.S. High School was an avid movie fan; he hardly missed a silent movie that ran in the tent cinema behind his school. Little did he realize then he himself would very soon be a movie star. The year 1934 proved to be a very important year for Rajam , a handsome lad of fifteen years; as also for his teacher Papanasam Sivan who in his mid-age (say about 44) was in search of a stable career in music. The year saw them launched into successful careers in films and music. The noted film critique historian Madabhushi Rangadorai who gained fame under his pen-name Randor Guy has described the circumstances that led Papanasam Sivan as also Rajam and family into the world of films. 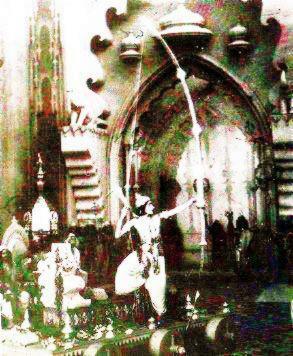 Rajam’s first film was Seetha Kalyanam (1934), a Prabhat Talkies production directed by the well known Marathi and Hindi filmmaker of his day, Baburao Phendharkar. 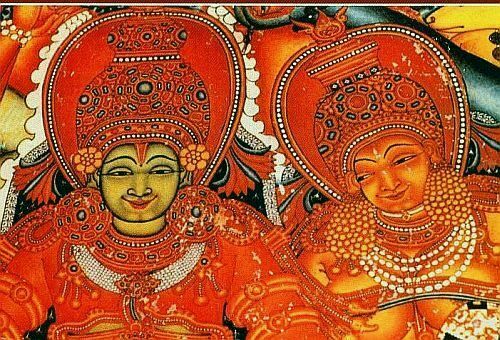 The strikingly handsome fifteen year lad Rajam of sharp features and slim figure played the leading role of Sri Rama, while his sister Jayalakshmi played the leading- lady Seetha. (That raised quite a few eyebrows). The film, in a way, was a family venture, as Rajam’s father Sundaram Ayyar played Janaka, while Rajam’ s other sister Saraswathi played Urmila and Rajam’s kid-brother Balachender played a child musician in the court of Demon King Ravana. The music was provided by Rajam’s teacher Papanasam Sivan. [For more on the Seethakalyanam Film, please check the following link and the references listed on the page. The film Seetha Kalyanam and its music was a huge success. It launched Rajam and his teacher Papanasam Sivan on their way to stardom. 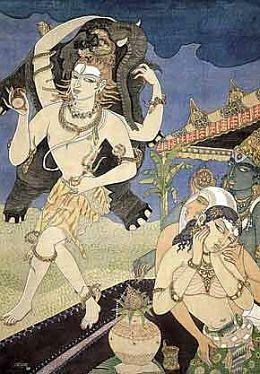 Some songs set to music by Papanasam Sivan ; and, sung by Rajam became hits. To mention a couple of those: ‘Nal vidai thaarum…’ (Raga Kalyani – based on Saint Thyagaraja’s ‘Amma Raavamaa…’); and, ‘Kaaranam ethu swami….’ (Raga Kaanada – based on Saint Purandaradasa’s composition ‘Sevaka kana ruchirey…). Following that success, Rajam’s second film was Radha Kalyanam (1935), produced by Meenakshi Movies and directed by C. K. Sathasivan (better known as Saachi). Rajam played the lead role of Krishna while Radha was played by the beautiful looking star of those days M.R. 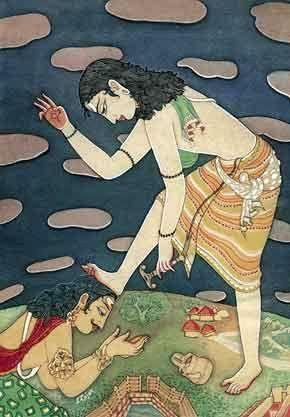 Santhanalakshmi who perhaps was elder to the hero Rajam. The music to the film was provided by the noted singer-composer Sri Harikesanallur Muthiah Bhagavatar. 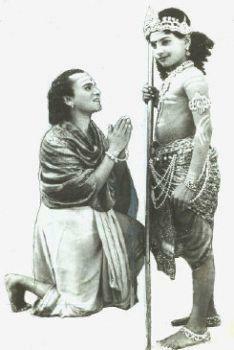 Rajam’s third film as hero was Rukmini Kalyanam (1936); and, Rajam played Krishna again. The film was directed by the famous Marathi filmmaker, actor and Baburao Phendharkar’s brother Balji Phendharkar. Of the three films in which Rajam played the leading role, it appears, the first film Seetha Kalyanam, was true success; the other two were not so successful. But, by then the handsome brothers S. Rajam (18) and Balachander (10) had gained fame as ‘Prabhat Prodigy Stars‘ and ‘South Indian Prodigies‘. They toured several cities in India and in Sri Lanka, performing duet-concerts. It is said, like the legendary Lav and Kush, the two handsome and talented young lads were the darlings of art-lovers and the cynosure of all eyes. 2.4. Shri Rajam played leading roles in three Tamil films Seetha-kalyanam, Radha-kalyanam and Rukmini-kalyanam; and also sang. By then Rajam was married and his wife was not in favour of his acting in movies. 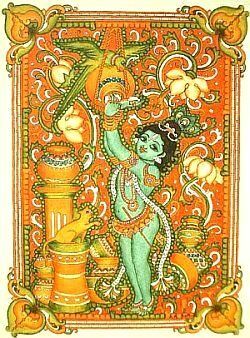 Shri Rajam later humorously remarked, all his three films were Kalyanams ; and , after his own Kalyanam there could not be any more Kalyanams. 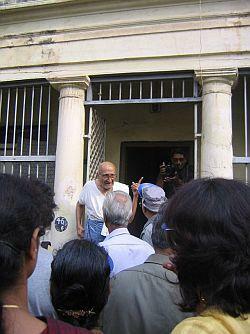 Shri Rajam’s association with the world of films was relatively brief ; but, it was highly successful. 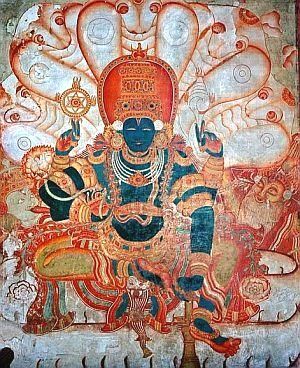 In the years thereafter, Shri Rajam visited many temples in India and Sri Lanka; and, stayed for a while in the 7th century temple of Sri Kailasanathar at Kanchipuram. Shri Rajam did however , later in 1942, played a supporting triple role of Lord Muruga; the boy-Murga; and, the hunter-Muruga in a hit movie Sivakavi in which the doyen of Tamil films Tyagaraja Bhagavathar the singer- actor played the lead role. Rajam’s sister Jayalakshmi played the leading lady in the film; while Rajam’s father Sundaram Ayyar played guru, the teacher of young Sivakavi. 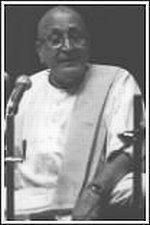 Later in 1948, Shri Rajam composed music and also sang the song ‘Kaathal puyalthaniley thurumbupol…’ in V. Shantaram’s ‘Nam Nadu’ the Tamil remake of his Hindi film ‘Apna Desh’. 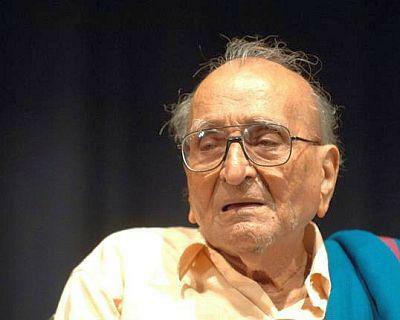 Shri S Rajam thus was a pioneer in the development of the Tamil films. Shri Rajam blessed with an agile mind and good health is today the senior-most living hero, the leading-man, of the Tamil film world. His contribution to Tamil films is recognized by one and all with pleasure and gratitude. 3.1. Shri S Rajam is a well recognized, much admired and an honored performing musician. In his home state, Tamil Nadu, he enjoys more fame in the world of music than in art. 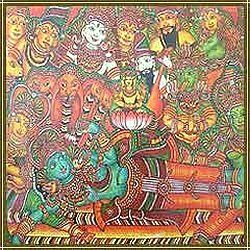 In one of the interviews to a music journal, Shri Rajam quietly remarked towards the end of the interview “Not many may know that I am a painter; and, I do original classical paintings. I divide my time between painting and music.” Such is the child-like candor and humility of the grand-old man of Indian arts and music…! 3.2. Shri S Rajam served for about 35 years as music supervisor and a Grade A artiste at the All India Radio (AIR), where he popularized Carnatic Music and also Thirukkural singing . 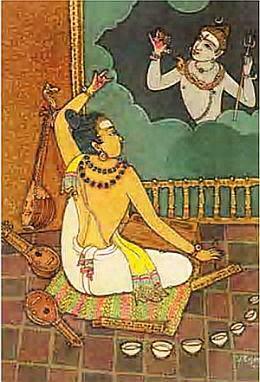 He performed full duration kutcheris based on Tirukkural couplets. During his tenure, he recorded rare compositions of the Vaggeyakars, produced many operas and musical plays. He later mentioned that his most cherished program with AIR was the presentation of Silappadikaram as an opera with a huge orchestra. “Our culture is a very ancient one; and, we have the responsibility of passing it on to the next generation in its truest form. I shall strive to do my best in this regard; and , I may even write a book”. Between 1970 and 1982, while serving AIR, he led a team of artists on a music tour to Africa , presenting a percussion ensemble; and, also toured USA performing 32 musical concerts in various cities. 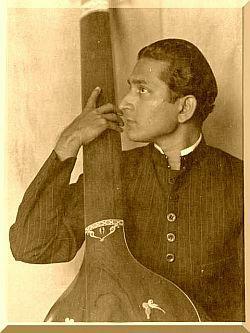 He also performed in Burma, Sri Lanka and Canada. His lecture demonstration on rare Ragas and kritis, vivadi Ragas, as also on the compositions of Koteeswara Iyer are admired by the connoisseurs. 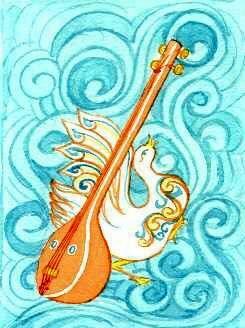 His special interest in vivadi ragas, as also Lakshana and Lakshya aspects of Carnatic music is well known. 3.3. 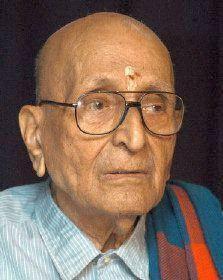 Shri Rajam continued to serve , till his last days , on the expert committee of the Music Academy at Chennai. His simplicity and willingness to help anyone who approaches him on subjects related to art and music has endeared him to all ; and , to the young, in particular. 3.4. Over the years, many honors have been showered on Shri Rajam. Just to name a few of those: He was awarded the title “Isai Kadal” (ocean of music) by the Tamil Sangham, Karikudi in 1988. He was accorded the Sangeetha Nataka Academy award in 1992; and , the Kala Acharya in 1996. The only significant honor he received from the Madras Music Academy (to which he contributed so much) has been the title of Sangeetha Acharya. Probably the best way to describe him is: Acharya. 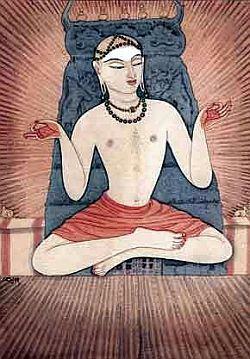 It is interesting that as early as 1947 when Shri Rajam was still a young man of about 28 years, the late K.V. 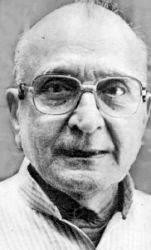 Ramachandran (well known Art critic), wrote him: “You know I am not given to praising anyone, still less over praising. If it were in my gift to give a title, and if any one deserves it in India today, you deserve the name of Acharya — the master in painting. I don’t flatter. 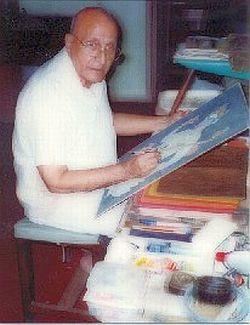 “Shri Ramachandran (1898-1956) , it is said , was in his day regarded the foremost music and art critic in the country. He was not easily pleased; and a ‘good-word’ from him was considered a high reward even by merited artists. 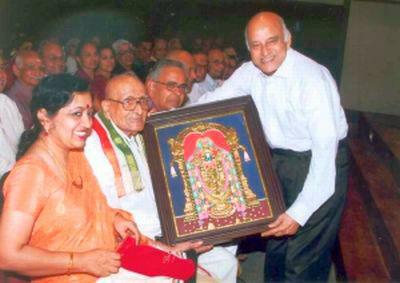 His high praise of Rajam signified the eminence that Shri Rajam enjoyed even as a young person. I understand that at the 76th South Indian music conference and festival of Indian Fine Arts Society to be held in Chennai during Dec 18, 2008 to Jan 4th, 2009, Shri S Rajam would be honored with the title, ‘Sangeetha Kalasikhamani‘. No honor is too high for Vidvan Shri S Rajam. 3.5. While reminiscenceing his musical training, Sri Rajam fondly recalls how his father Sundaram Ayyar took him, while still a lad of ten, to the well known musician Sri Ambi Dikshitar (son of the renowned Sri Subbarama Dikshitar) for music lessons. 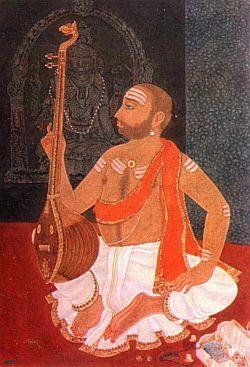 Talking about his Guru, Shri Rajam mentions that Sri Ambi Dikshitar had a deep voice of low sruthi that could easily touch the panchama in the lower octave; and Ambi Dikshitar’s voice was well suited for rendering, with clarity, the grand and slow paced compositions of Sri Mutthuswami Dikshitar. 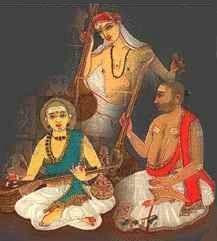 Rajam was amused that his teacher , a descendant of the Mutthuswami Dikshitar lineage , should commence his lessons with a composition of Sri Thyagaraja (enta nercina in shuddha dhanyaasi). It was a rare privilege, he remarked, and a great fortune. Later, of course, Sri Ambi Dikshitar taught Rajam many compositions of Sri Mutthuswami Dikshitar, most notable being the Navagraha kritis. 3.7. S Rajam’s favourite composer is Koteeswara Iyer (January 1870 – October 21, 1936) popularly known as Kavi Kunjara Dasan. “I am deeply interested in Koteeswara Iyer’s compositions” S Rajam said, ” I do not compare any other composer with him, I find great pleasure in singing his compositions”. 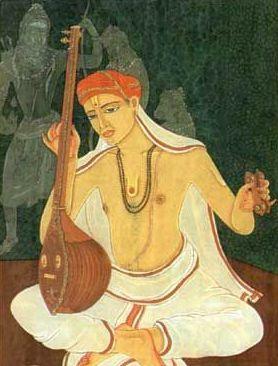 Koteeswara Iyer was the first composer, after Sri Mutthuswami Dikshitar, who composed krithis in all 72 Melakartha-ragas. 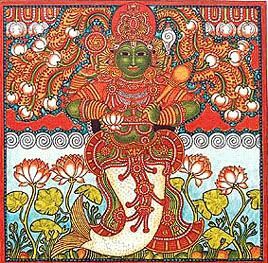 His monumental work, “kanda ganamudam” has songs, in praise of Lord Muruga, composed in all the 72 Melas. The songs are in chaste Tamil. 3.8. Shri S. Rajam has the distinction of being the only musician to have sung all those 72 compositions; each kriti being accompanied by raga-alapana, neraval and kalpana-svaras. He said,” It is vital to understand the meaning and bhava of a composition to make an emotional presentation or render the song with insight “. His rendering of Koteeswara Iyer’s songs is recorded in a set of ten tapes / nine CDs. Sri S. Rajam has also published a book giving notations for all the 72 songs. 4.1. Shri S Rajam is the golden link (svarna setu) between music and art. 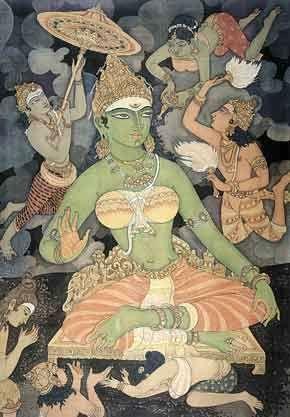 He provided a visual identity and a tangible idiom of expression to Indian classical music through his paintings. 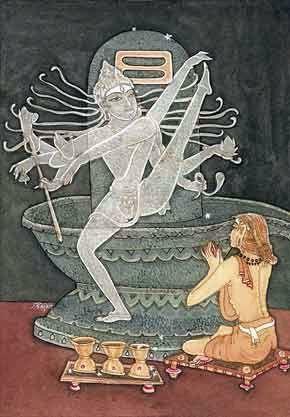 For instance; just to mention a few, his series of paintings Origin & Classification of Svaras (inspired by Sangeetha Kalpadrumam of Harikesanallur Muthaiah Bhagavatar), illustrating the origins and characteristics of each of the seven notes of Indian music, explaining their nature and their relation to the Hindustani and Western music systems, is a remarkable work of great learning and sublime art. I have not come across a like of it anywhere else. 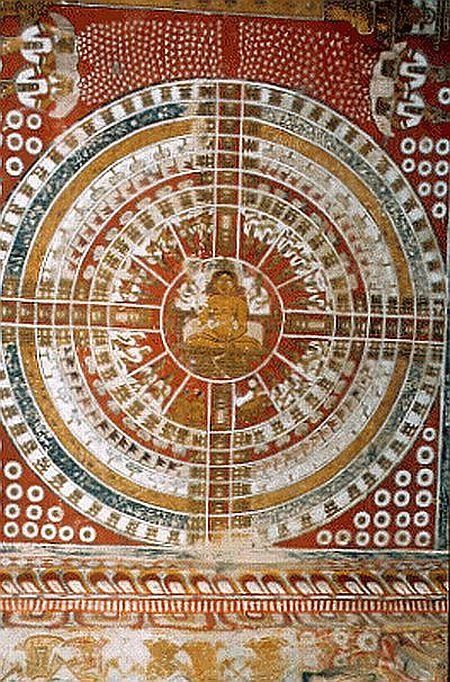 Similarly, his series of twelve paintings illustrating Venkatamakhi’s Melakartha scheme by classifying the 72 Mela ragas into 12 Chakras or segments; associating each Chakra with a month of the year (from April- March) ; and, illustrating them through soulful and imaginative paintings is a marvelous example of the delightful amalgam of innovation , scholarship and superb artistry. It is a unique piece of visual poetry and music. 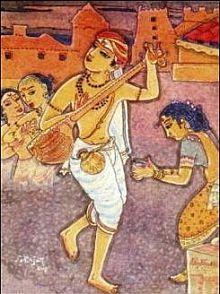 This series was also meant as a tribute to Venkatamakhi the great musician-musicologist (1635-1690). 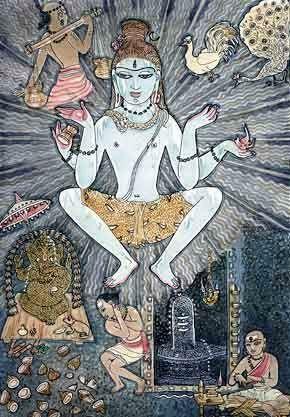 And, his series of paintings illustrating the kritis and particularly the Navagraha kritis of Sri Mutthuswami Dikshitar are, of course, legendary; and have passed into the folklore of music, astrology, and tantra traditions; and also have become idioms in classical school of painting. 4.3. His portraitures of the composers in the classical traditions of Indian music are benchmarks; and now, after his advent, one can scarcely visualize the hoary composers but through the eyes of Shri S Rajam. 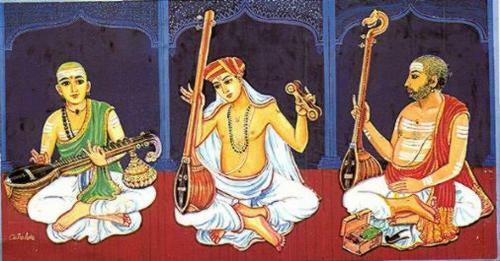 His portrait of the trinity of Carnatic music (Saint Thyagaraja, Sri Mutthuswami Dikshitar and Sri Shyama Shastri) which he painted when he was barely twenty years of age is a true classic; it is a universally acclaimed archetype and one that is even worshipped. 4.4. Hallmarks of his portraits are their authenticity. He studied and researched into his subjects thoroughly, grasped the essence of their character and achievements. His portraits therefore bring out not mere the physical resemblance of the subjects but more importantly the essence of their very inner being. 4.5. 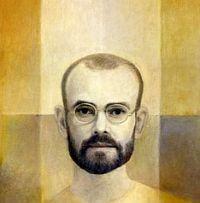 There are some interesting stories associated with his portraitures of the Music Trinity. 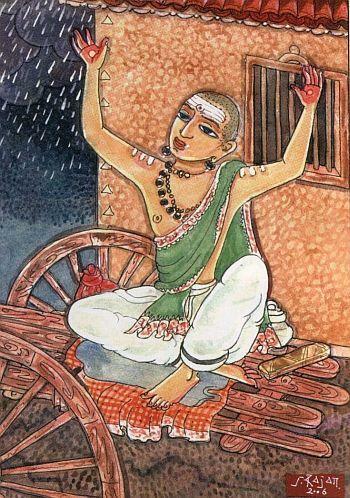 In the case of Saint Thyagaraja, the old drawings available at that time (before 1940) showed a weak, melancholic person with his chest bones protruding and having a rather sickly countenance. 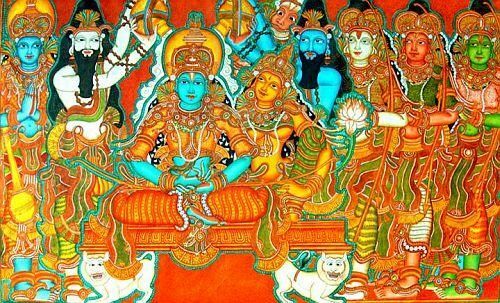 Shri S Rajam felt offended by the old portraits; and was hurt the saint was shown in a poor light causing injustice to his genius. Shri S Rajam strongly felt that the portrait should aptly project the character and greatness of the person, his achievements, his genius and his mellow glowing sattvic nature; and not just his physical resemblance. 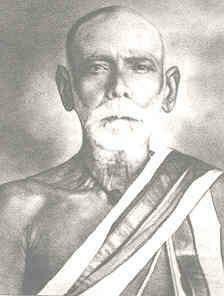 Sri Mutthuswami Dikshitar was an Upasaka of Sri Chakra and the Devi; he was an advaitin in his outlook. There was always a certain serene detachment about him; and in his eyes. In Shri S Rajam’s portraits, Sri Dikshitar comes across as a calm, composed, handsome young person of lime-color (golden hue) complexion. 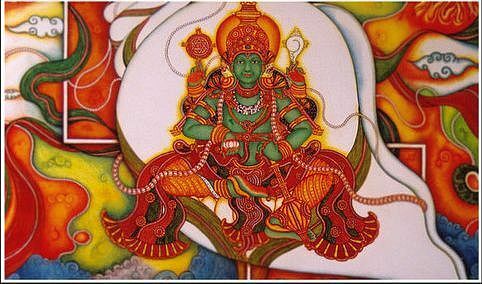 He always wears a green (or a blue) shawl over his left shoulder, and sports rudraksha -mala around his neck. 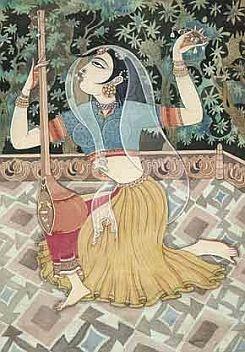 His veena is upturned; with the face of the yali looking up. 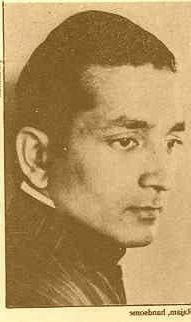 His portrait of Sri Shyama Shastri which eventually turned into an Indian postal stamp has an interesting story around it. 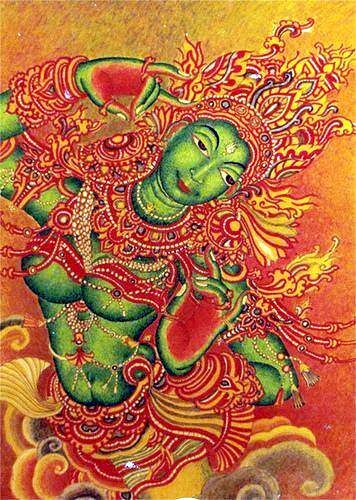 Sri Shyama Shastri too was a Devi Upasaka, but charged with intense devotion and a poignant longing for the Mother. He was a deeply religious person who adhered to the prescriptions of the scriptures. He always had a dash of vermilion (Devi –prasada) right between his eye brows and stripes of Vibhuthi across his forehead; he sported a tuft (Kudumi) and appeared with stubble on his chin, because he shaved only once in a fortnight just as an orthodox Brahmin would do. 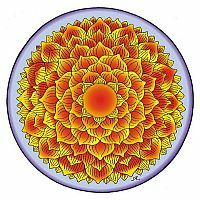 Sri Shyama Shastri – was a dark, handsome, serious looking person, rather absorbed in himself ; and , had a slight rotund around his waist. 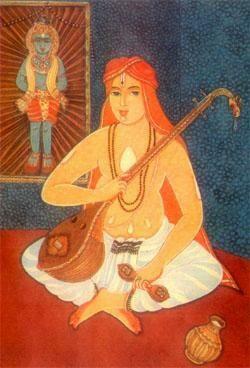 He was always dressed in a gold-laced (zari) dhoti and a red upper garment (uttariya). He was fond of chewing betel leaf (paan); his lips are depicted dark red (He is occasionally shown with a paan petti, a small box to hold leaves and nuts). 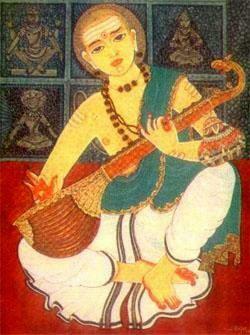 Sri Shyama Shastri’s tambura had a yali-mukham, not usually found in other tambura depictions. 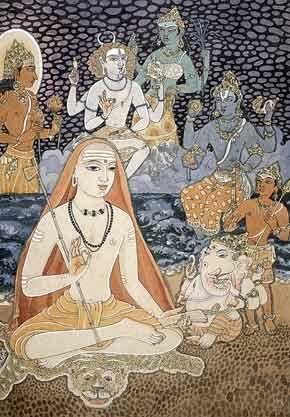 Another interesting incident came up when Shri Rajam had to paint the picture of Venkatamakhin [1635-1690, the great musicologist who devised the Melakartha system of classifying ragas in the Carnatic music] as an introductory painting for the Apr 2008 – March 2009 calendar brought out by L&T, he had no earlier pictures of Venkatamakhin to guide him. 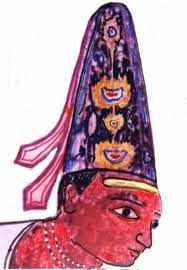 His research into the archives of Kanci mutt led him to an interesting detail showing that Venkatamakhin who was also a skillful vainika wore his long hair in a coil such that it did not touch his body; he coiled it atop his head. 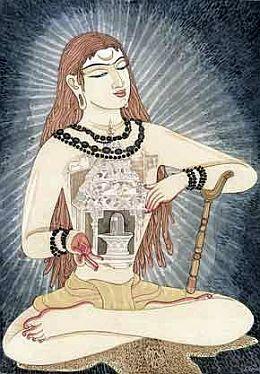 Shri S Rajam then pictured Venkatamakhin with coiled locks of hair, rudraksha-mala; and surrounded by musical instruments such as veena, tambura etc. as also scrolls of ancient manuscripts, lending the picture an air scholarship and a spiritual aura. 4.6. It is said, nowhere is the bond between the arts stronger than that binding painting and music. As sister arts, music and painting share a common vocabulary. Both arts are often referred to as compositions; both talk in terms of tones and shades; and, there is a certain rhythm and fluency in both. 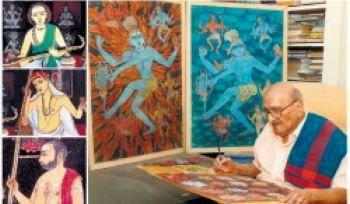 In the present Indian context, nowhere do both the arts find their fulfillment, in creative as well as traditional sense, in one person than in Vidvan Shri S Rajam. 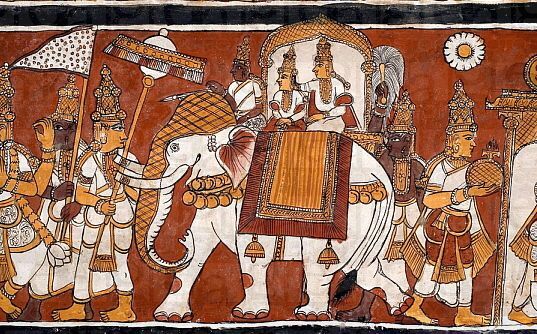 [This Twelfth article in the series; and , it follows the one on the murals of Kerala which talked, in general, about some of the main features of the traditional mural art of Kerala, which has a unique style of drawing and depiction; and colour schemes. 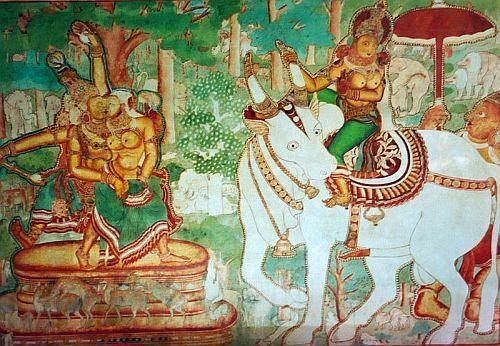 The present article looks at the murals at Mattanchery and Padmanabhapuram Palaces, as particular instances of traditional Kerala mural art.. 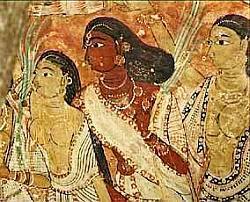 This article and its companion posts may be treated as an extension of the series I posted on the Art of Painting in Ancient India ..
49.1. Mattancherry , in Cochin, had been the former capital of the erstwhile rulers of Kochi. It was a bustling sea port to where the Portuguese and the Dutch traders were drawn by the lure of the legendary spices of the East, especially the black pepper. 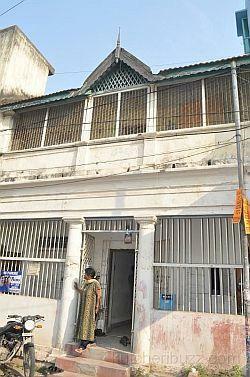 They established business houses and built large warehouses, at Kochi. 49.2. 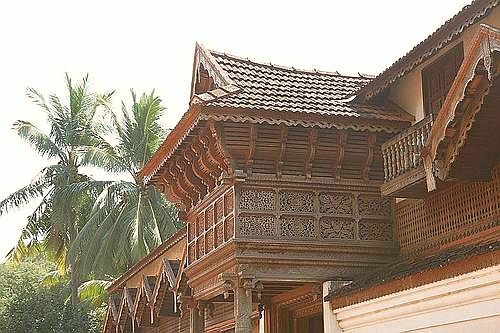 It is said; the Portuguese traders, in order to seek favours, beguile or appease the then king of Kochi, Veera Kerala Varma Thampuran (1537-61), built for his use (in 1552/1555) a palace at Mattanchery and also gifted him a golden crown. The Dutch, who later arrived on the scene by 1663, promptly displaced the Portuguese and took over the spice trade. The Dutch, for reasons similar to the ones that prompted the Portuguese, refurbished the king’s palace at Mattanchery. Since then, the Mattanchery palace has come to be known as the Dutch Palace. It had been the residence of the Kochi royal family for about two centuries. 49.2. There is a certain medieval charm and simplicity about the Mattancherry Palace .The palace is a blend of Portuguese architecture and Kerala style of construction,; a ‘Nettukettu’ (four buildings) with a shrine of Pazhayannur Bhagavathy, deity of the royal family, in the central courtyard. Its interiors are made beautiful with rich wood work and exquisite flooring that looks like polished black granite; but it is actually made of a mixture of charcoal, burnt coconut shells, lime, plant juices and egg whites. The palace has within it two other temples, dedicated to Krishna and Shiva. The Mattancherry Palace is included in the ‘Tentative list of nominations‘ in India , under the World Heritage List of the UNESCO. 50.1. 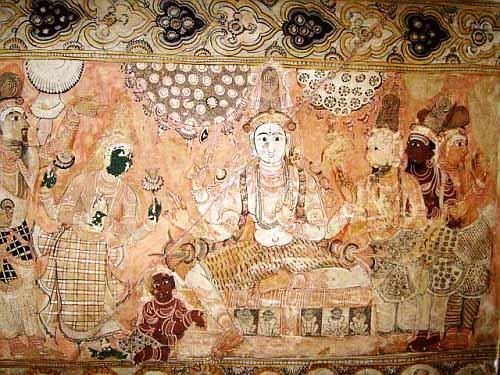 During the 16th and 17th centuries, the walls in some rooms of the palace were painted with scenes from Ramayana, Mahabharata and other epic poems. Most of the murals are adorned with decorative textile design borders filled with figures of the flowers, creepers, birds, animals etc. The paintings are massive and are spread over a total area of almost 1000 sq. ft.
50.2. The palace is a treasury of the 16th-17th century Kerala art. It is an artist’s delight. It is said; the late Amrita Sher Gill, the well known painter who visited the palace in 1937 was fascinated by these ‘perfectly marvellous old paintings’. In a letter to her sister, she said she was surprised by the technique and the amazing knowledge of form and the power of observation of the painters. 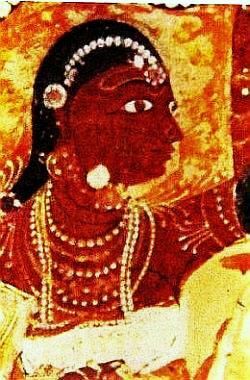 According to her, the Mattanchery paintings were more powerful than the Ajanta frescoes; but the latter were superior from the painting and artistic aspects. 50.3. 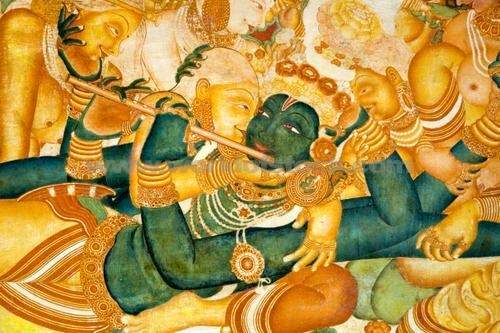 The earliest paintings of the 16th century are on the theme of Venugopala (Krishna as the divine flute player). 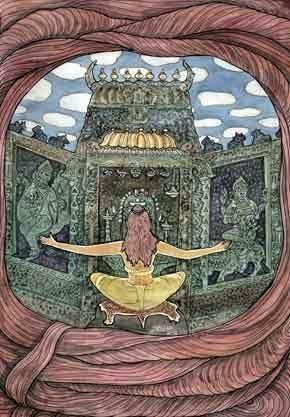 These panels were, in later years, interspersed with paintings depicting episodes from the epic-poem the Ramayana. 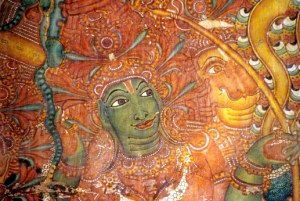 Some say that the Mattanchery palace Ramayana murals are the visual interpretations of the Adhyatma Ramayana of Ezhuthachan, the great Malayalam poet of the 15th century. 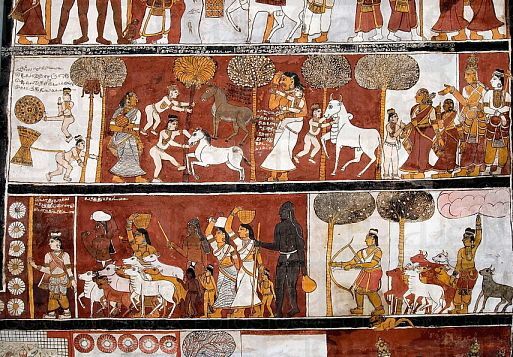 The Ramayana murals of Mattanchery palace depict the story of Rama, commencing from Dasharatha offering a yajna praying to gods to grant him sons; and it concludes with Rama returning, triumphantly , to Ayodhya , along with his beloved Sita and brother Lakshmana. 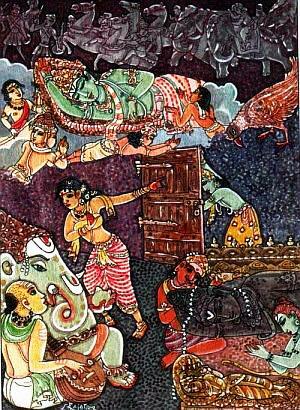 The Rama-story is rendered in about 48 paintings covering nearly 300 sq ft (28 m2) of wall surface. Rama’s nobility, unsullied character and composure even while placed in adverse situations, comes through serenely. The narration of the episodes flow smoothly, each panel theme lucidly leading to the next. 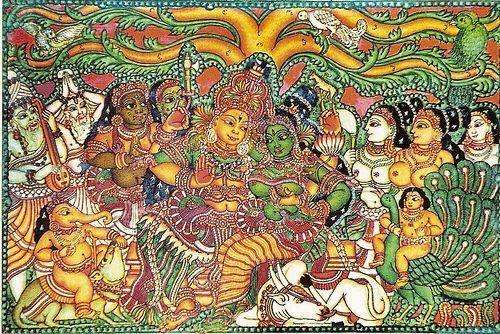 The themes are separated from one another by decorative borders, unique to the Kerala mural tradition. Besides giving a subtle form of relief to the pictures, they seem to convey a sense of motion. 50.5. 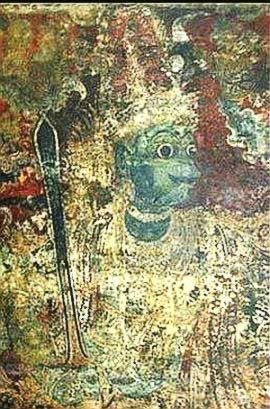 Besides the Ramayana paintings there are portrayals of Krishna holding aloft Govardhana hill, another of a flute-playing Krishna (Venugopala) in jewel-like green. 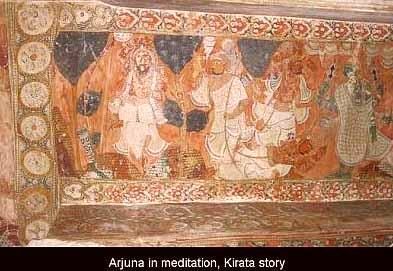 There is also a mural of Krishna in reclining posture, surrounded by gopis,. His languid pose belies the activity of his six hands and two feet, caressing his adoring admirers. Apparently, these panels were later additions. 50.6. 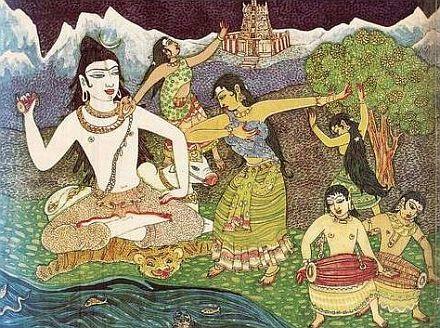 The themes from the epic poem Kumara-sambhavam of the poet Kalidasa depict Shiva and Uma in their snow abode atop the Mount Kailas. 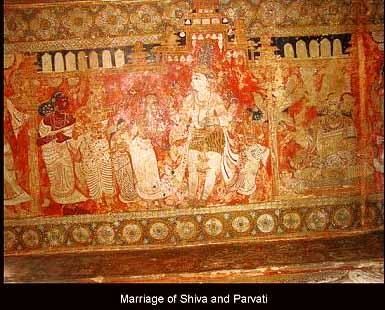 A painting on the walls of the Raja’s bedroom depicts Shiva and his consort Parvathi in embrace. They are surrounded by their son Ganapathi and other admirers. Interestingly, a guard wearing a Portuguese helmet and wielding a halberd, slaves and sages stand nearby. 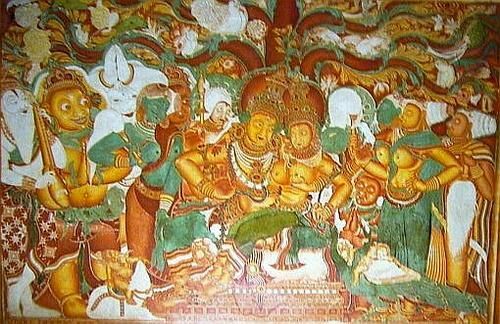 These paintings belong to a much later period than the Ramayana scenes; some of them to the beginning of the 18th and 19th centuries. 50.7. 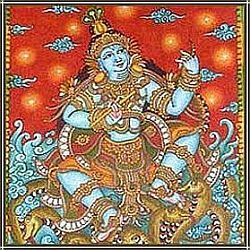 Among the depiction of Vishnu, his portrayal as Vaikuntanatha and Ananthasayanamurti are well known. The seated Vishnu (Vaikuntanatha) under the canopy of five-hooded Anantha-naga is a rare depiction of Vishnu. 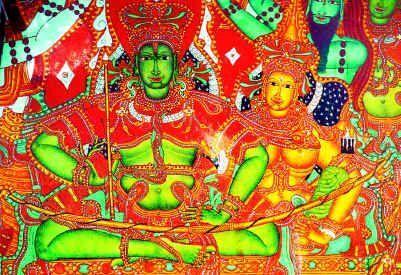 It is said to be a replica of the deity at the Sree Poornathrayeesa Temple at Tripunithura, the family deity of the erstwhile Kochi dynasty. 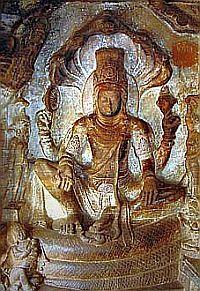 The Vishnu image at Tripunithura was, in turn, perhaps inspired by the Vishnu sculpture at the 6th century rock – cut temple of Badami. 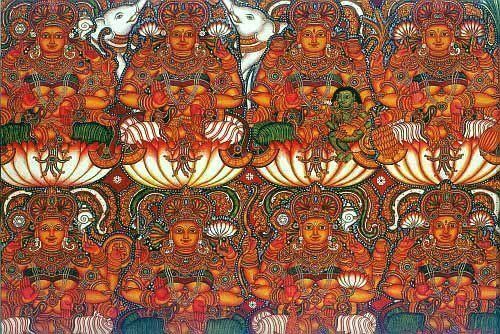 There is also a composition of Lakshmi seated on a lotus. These are among the latest works in the palace. 50.8. 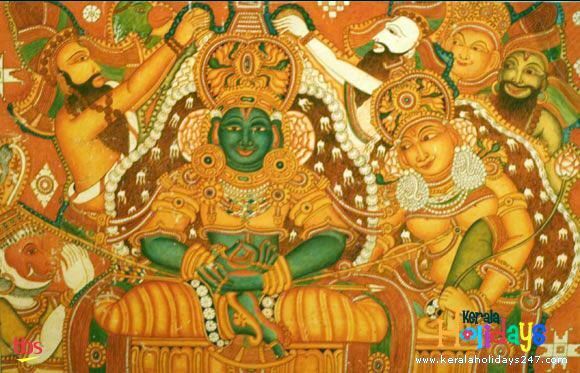 According to the website of the Corporation of Cochin, many of these murals were painted in the traditional style by one Shri Govindan Embranthiri of Narayana- mangalam. No details are given. 51.1. 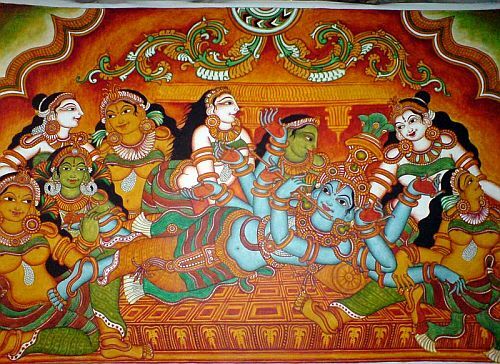 The beautiful and extensive murals of Mattanchery palace are fine examples of traditional Kerala mural art. Some of them are hailed for their style of depiction. 51.2. The murals are packed with details in gloriously rich colours; the style is never strictly true-to-life; the treatment of facial features is trimmed down to the simplest of lines for the mouths, and aquiline noses. 51.3. 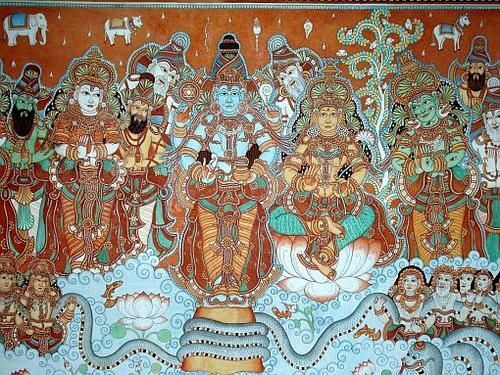 True to the Kerala tradition, the murals at Mattanchery are characterized by the warmth and grandeur of rich colours, elaborate ornamentation, sumptuousness of the outline, depiction of volume through subtle shading, a crowding of space by divine or heroic figures; a strong sense of design and well defined picturization. 54.1. 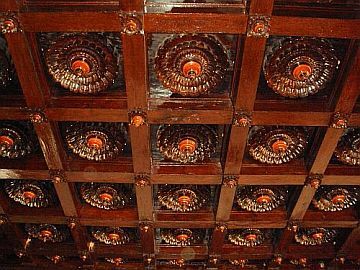 Padmanabhapuram palace, the exquisite wooden palace was constructed in the early years of the seventeenth century (say, around 1602) during the reign of by Iravipillai Iravivarma Kulasekhara Perumal who ruled Travancore State between 1592 and 1609 A.D. It is said to have been built upon an earlier mud palace in the Nalukettu style of architecture, constructed during the 14th Century. 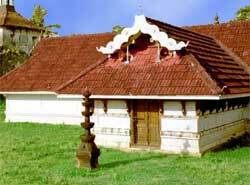 The Padmanabhapuram palace is a splendid illustration of the traditional Kerala architectural style. it is unlike any other palace in India. 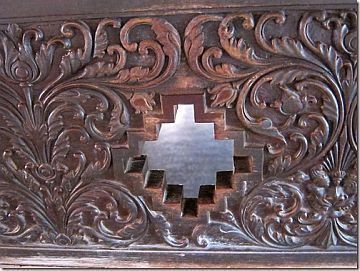 Replete with intricate wood carvings and ornate murals, the Palace is an exceptional example of indigenous building techniques and craftsmanship in wood; a style unparalleled in the world and based on historic building system, Taccusastra (the science of carpentry) unique to this region. The 6.5 acres of the Padmanabhapuram Palace complex is set within a fort of 185 acres located strategically at the foot hills of Veli hills, Western Ghats. The palace complex, which includes fourteen function specific independent buildings surrounded by a 4 km-long stone fort, is located virtually at the land’s-end. 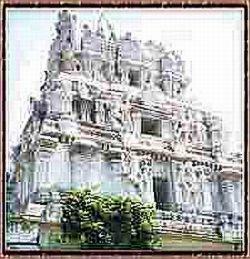 The fourteen denoted structures include Kottarams (Palaces); Pura (House or structure); Malikas (Mansions); Vilasams (Mansions) and Mandapams (large Halls). 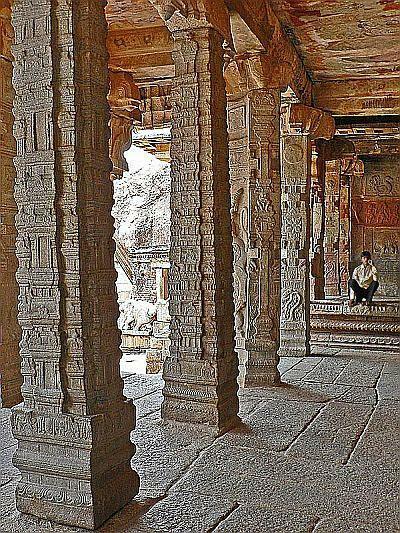 The Palace structure is constructed out of wood with laterite (locally available building stone) used very minimally for plinths and for a few select walls. The roof structure is constructed out of timber, covered with clay tiles. 54.2. The Palace served as the secure official residence to the Travancore Kings for about two hundred years from 1550 to 1750. 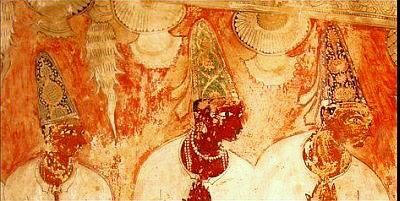 It is said, the reign of the King Marthanda Varma (1729-1758), was a glorious period in the history of Padmanabhapuram palace. He provided a serene and secure ambiance to the palace; and gave it its present name – Padmanabhapuram palace (c.1744) in honour of the State’s patron deity. 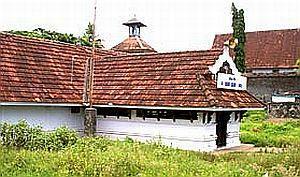 Its earlier name was Kalkulam. 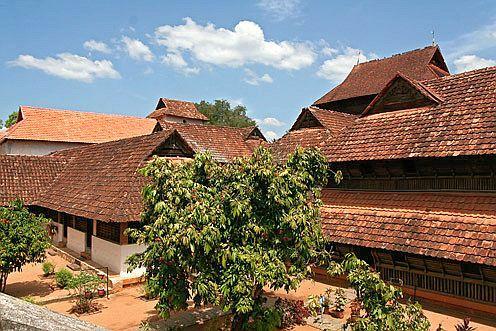 The Padmanabhapuram palace was the centre of political power during the years 1600 to 1790, that is till the time the state capital was shifted to Thiruvananthapuram (also known as Trivandrum). In 1993, a Museum building was set up in the Southwest corner of this Palace complex, and houses numerous invaluable stone inscriptions and copper plate inscriptions, sculptures in wood and stone, armoury, coins, paintings, and household objects pertaining to the history and heritage of the region. 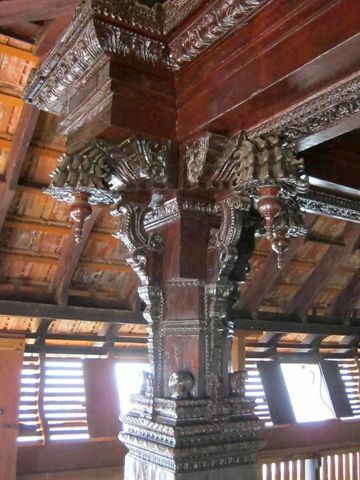 Padmanabhapuram Palace is the oldest, largest and well preserved surviving example representative of the traditional wooden architecture in India. 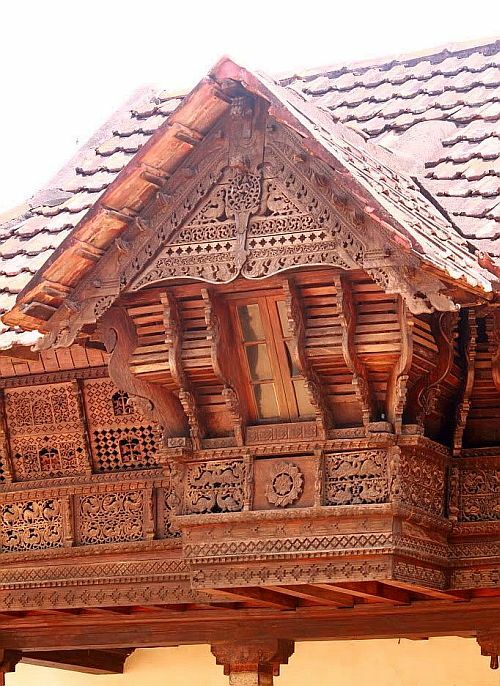 It is an testimony to the traditional architectural knowledge and skill of Kerala. It is , therefore, included in the ‘Tentative list of nominations‘ in India , under the World Heritage List of the UNESCO. 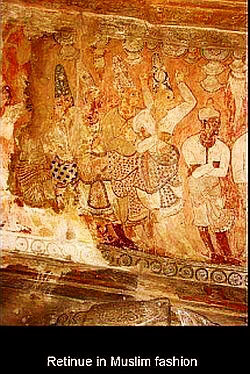 55.1.One of the structures in the Palace is an outstanding example of the Mural art form. 55.2. 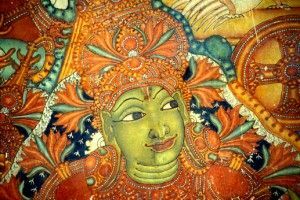 The murals at Padmanabhapuram are exceptional. 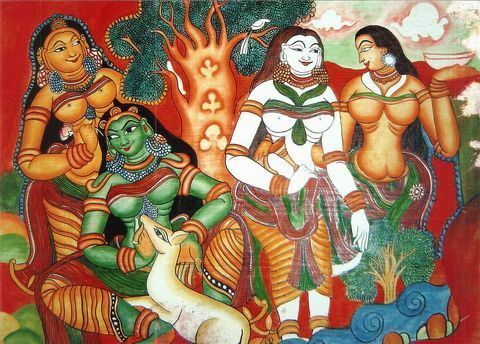 Besides the depiction of scenes and characters from Hindu mythologies, there are murals also on secular themes which reflect the socio political conditions, fashions and customs of the times. 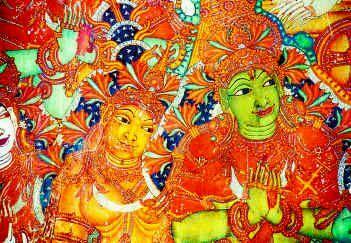 The UppirikaMalika or the four-storeyed building, constructed in 1750 CE, includes the treasury chamber on the first floor, Maharaja’s resting room on the second floor, and the revered prayer room on the third floor the walls of which are replete with traditional Kerala mural art work. 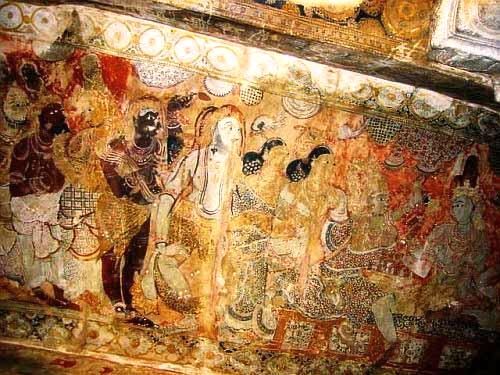 The walls of the chamber in the topmost floor (Upparika malika) of the palace are covered with beautiful murals painted in the traditional Kerala style; and, they resemble the paintings at the Sri Padmanabha Swami Temple of Thiruvananthapuram. 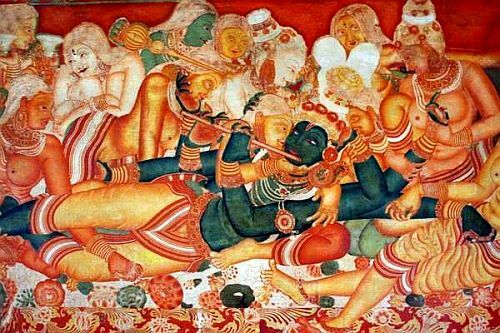 About forty-five of those murals occupy almost 900 sq ft of wall surface, depicting Vaishnava themes, such as: Anantasayanan, Lakshminarayana, Krishna with Gopis, Sastha etc. 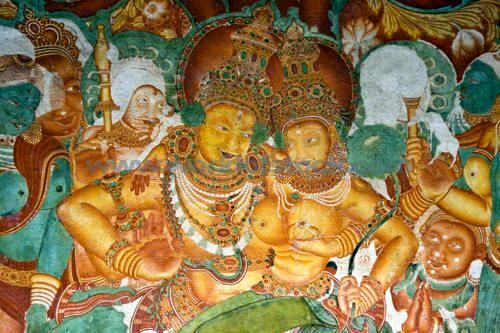 The murals at the Padmanabhapuram palace – executed in the traditional style invoking rich and vivid realism and infusing grace and beauty of the figures – are the best preserved in the State . 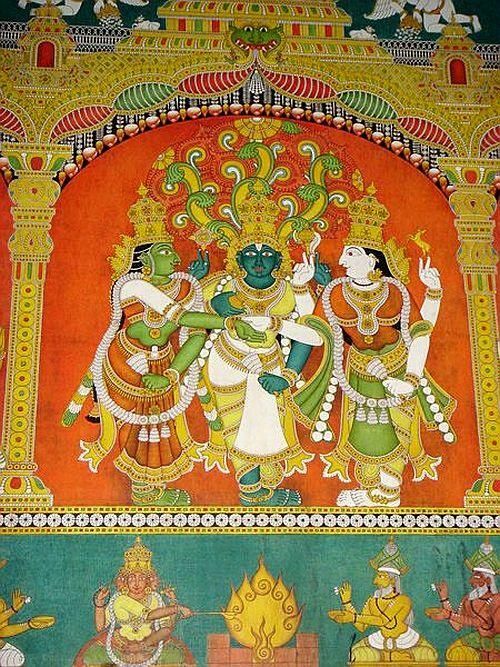 The depiction of the Krishna theme (Krishna – leela) is inspired by Sri Krishna Karnamrutham, a collection of divine verses charged with intense love of Krishna, attributed to Biva-mangala (c.1220-1300 AD). 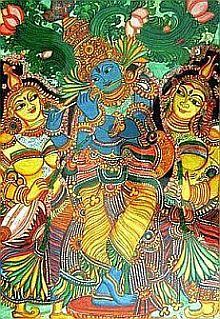 We shall move on to the 20th and 21st century and admire the sublime paintings of Shri S Rajam, perhaps the sole votary of Chitrasutra tradition in the modern times. 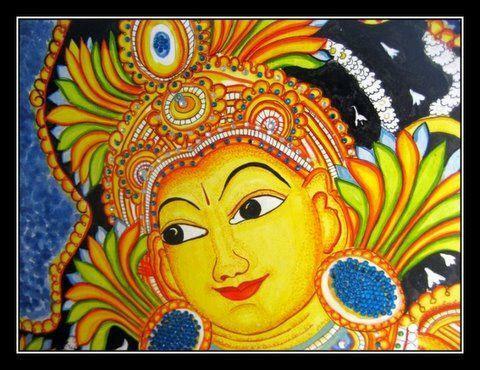 Murals of Kerala by M G Shashibhooshan, Dept. Of Public Relations, Kerala State. [This is the Ninth article in the series. 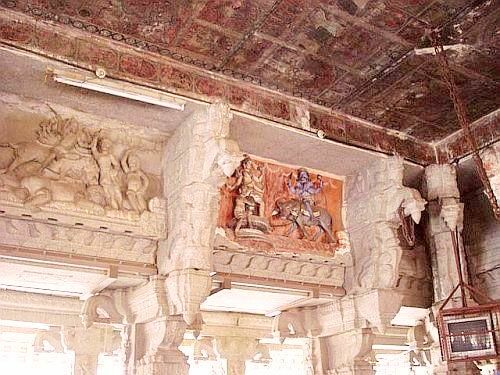 The present article looks at the paintings on the ceilings of the Veerabhadra temple in Lepakshi (AP).They represent some of the best of Vijayanagara art. This temple is one of the earliest constructed not by the Kings but by two brothers who were philanthropic noblemen. 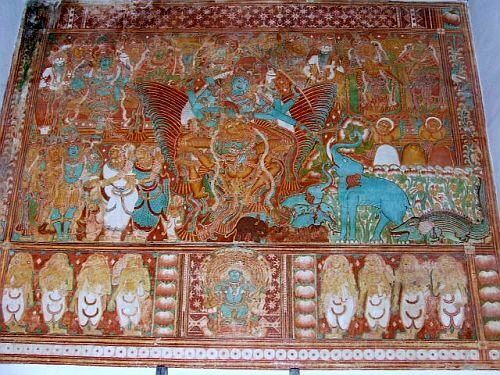 The textile and fashion designs depicted in the Lepakshi paintings have influenced handicrafts, sari designs etc. 2.1. Lepakshi in Anantapur district, on the Andhra Pradesh – Karnataka border near the Pennar River, is a group of temples built in the 16th century, on a single granite outcrop that is curved like the back of a tortoise. And, the hill was aptly called Kurma-shila. 32.2. 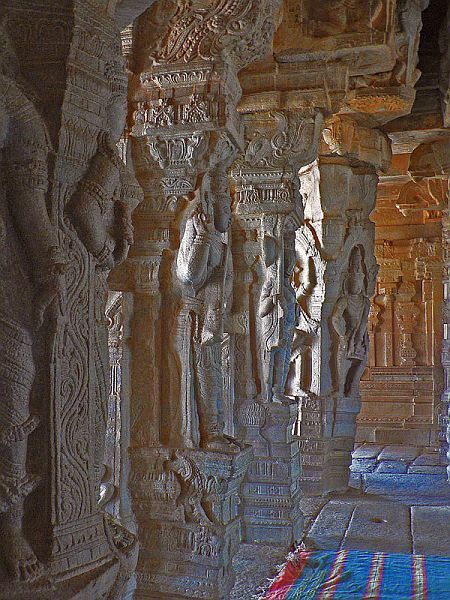 Lepakshi is an excellent display of the Vijayanagar School of architecture, sculpture and painting. It brings together magnificent sculptures carved with intricate designs; and a whole set of beautiful, narrative and innovative paintings on its ceilings. The temple is hailed as a delightful synthesis of architecture, sculpture and painting. 32.3. 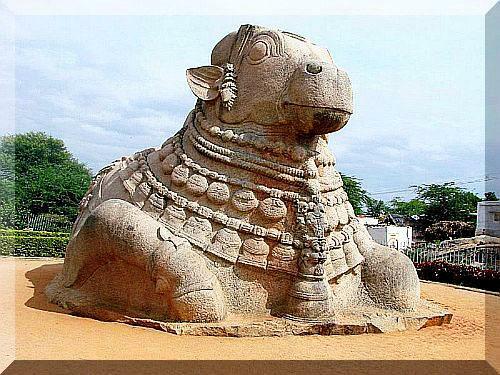 Lepakshi is regarded very important for its historical, archaeological and aesthetic value. 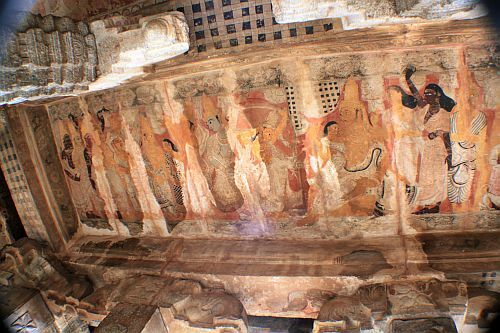 It houses some of the finest sculpture of the period; it has the earliest preserved cycle of mural paintings in the Vijayanagar style; and it also has inscriptions in old-Kannada dating back to many centuries. The Lepakshi temple is a source-material for the study of architecture, painting, iconography and the mythological presentations of the Vijayanagar period. It also offers a few lessons to the art historians and those interested in the preservation and restoration of traditional arts. 33.1. 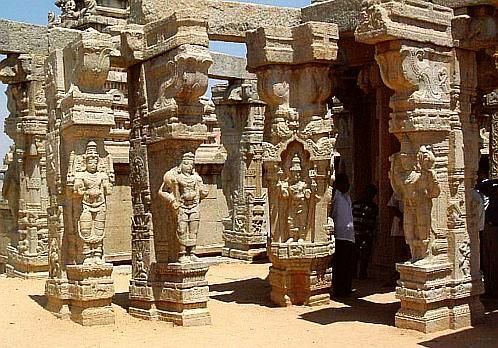 The construction of the temples at Lepakshi is attributed to the initiative and enterprise of two brothers: Veeranna and Virupanna, noblemen and wealthy merchants of their time. It is said; Virupanna was the officer in charge of the state treasury of the local government with its seat in the Fort of Penukonda, administered by a governor appointed by Achyuta Deva Raya (1529-1547) the Vijayanagar King of Tuluva dynasty. 33.2. 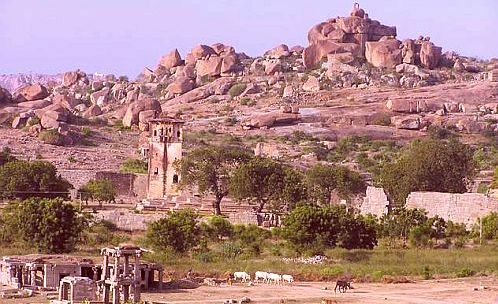 Penukonda (meaning The Big Hill and mentioned as Ghana-giri in the inscriptions) was an important and an affluent province of the Vijayanagar Empire; and the rulers of Vijayanagar and Penukonda were also related by marriages. After the fall of Vijayanagar (1565), Penukonda served as its temporary capital providing a safe house to its vanquished rulers. 33.3. 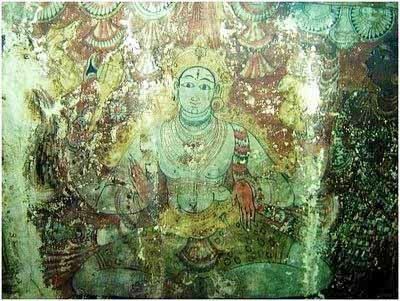 An ancient temple of Lord Veerabhadra – the ferocious and formidable aspect of Shiva- stood on the tortoise-hill (Kurma-shila). 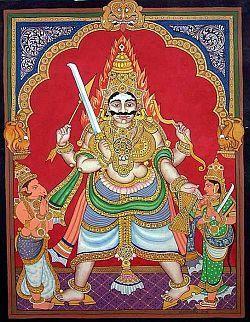 The Veerabhadra cult was quite popular during the Vijayanagar period and a number of temples were dedicated to that fearsome lord; the most prominent being the Uddane Veerabhadra, a larger than-life idol with four arms and armoured with sword, mace, axe, shield and bow ready to launch an attack on the enemy. Veerabhadra was the mascot, the war- cry and the inspiration of the armies and fighting forces of Vijayanagar. 33.4. 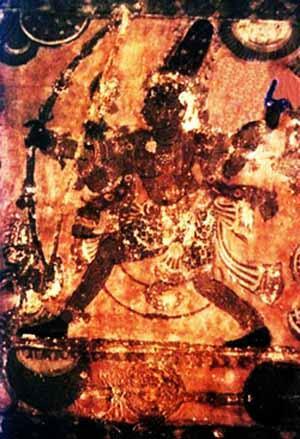 One of the brothers, Veeranna, was named after the warring deity. 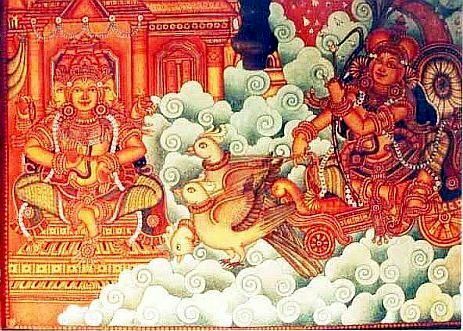 The brothers, perhaps, had a special affinity towards Lord Veerabhadra. The brothers took upon themselves, as an act of devotion, to renovate and enlarge the ancient temple and to expand it into a temple complex. 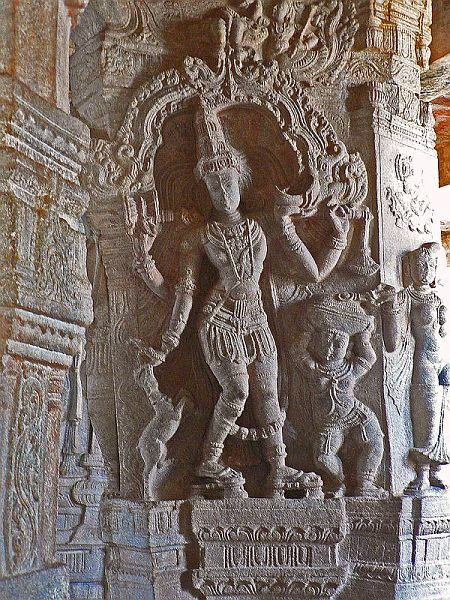 By around the year 1538, they did succeed in erecting exquisite temples of Veerabhadra, Shiva and Vishnu, between two asymmetrical enclosures, containing a central pavilion (mukha-mantapa), an intermediate hall (ardha-mantapa) and a pavilion for dance performances (ranga-mantapa). 34.1. 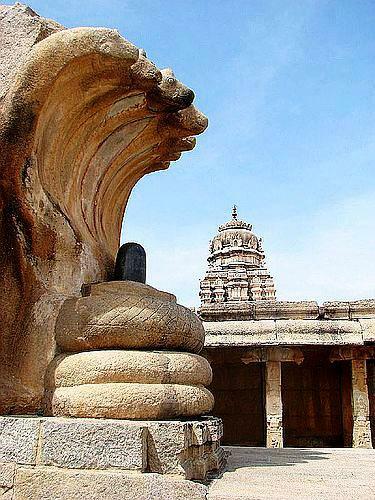 The Lepakshi temple complex is a wonderful example of Vijayanagar architectural style. It is an exquisite shrine; rich with profusion of gopuras, vimanas, apsaras, half-relief carvings, sprawling structures with wide spaces and courtyards. The ranga-mantapa and the ardha-mantapa are adorned with splendid architecture. The sculptures here depict images of dancers, musicians; as also themes from puranas, like those of Anantha-shayana, Dattatreya, Bramha, Tumburu, Narada and Rambha etc. 34.2. 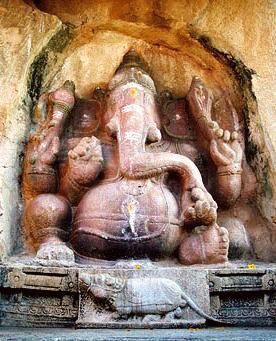 A monolithic Naga-linga, a Shiva linga with a multi hooded Naga serpent over it; the huge and majestic looking Nandi Bull carved out of single granite; and an imposing Ganesha, are some of the other splendid architectural features. 34.3. Even with all that, the temple is incomplete. 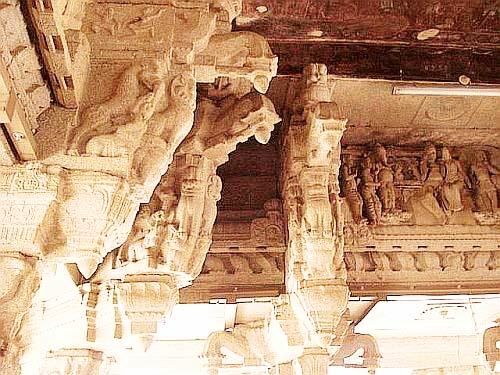 The sprawling kalyana-mantapa, meant as a sacred space for celebrating the wedding of Shiva with his beloved Girija, has splendid and richly carved massive pillars; but there is no roof over them. It looks like an unfinished saga in stone. The stories and legends that narrate how and why the builders’ dreams were aborted; and how the place acquired the name Lepakshi, abound. Yet, the unfinished kalyana-mantapa has about it a sort of haunted look. 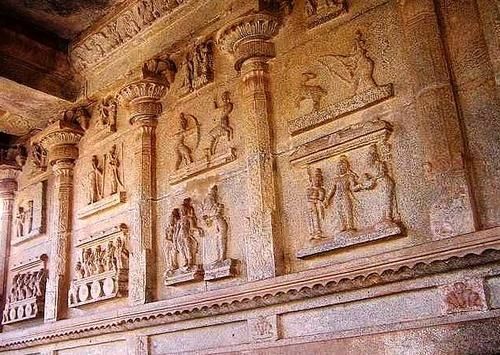 35.1 The Lepakshi temple is also celebrated for its paintings; though some have vanished and the others are weathering with time. But, at one-time the paintings were covered under thick layer of soot. 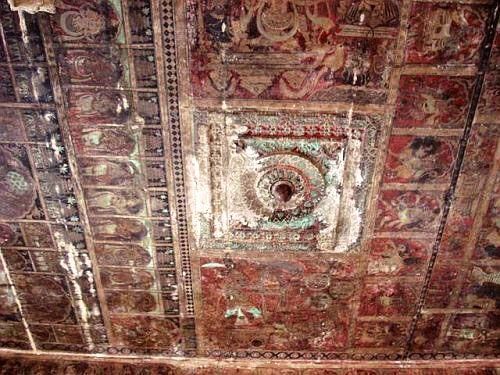 Thanks to the efforts of the Archaeological Survey of India (ASI), a number of panels on the ceilings of the ranga-mantapa and the natya mantapa have been restored. 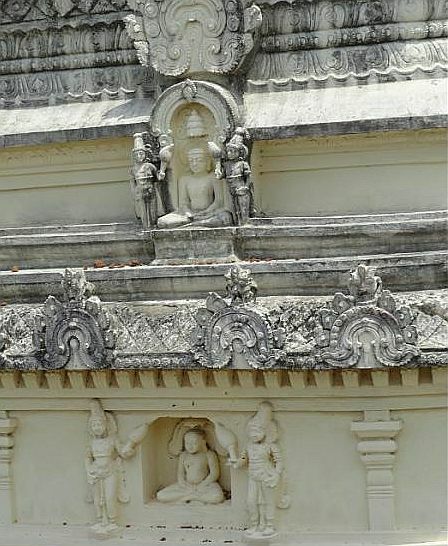 Shri S. Subbaraman, who retired as Superintending Archaeological Chemist from the ASI says that he was thrilled when “A ten-handed, highly ornamented figure of Veerabhadra, 16 feet in length, all but invisible under the thick layer of soot, made a spectacular reappearance in all its details and bright colour”. 35.2. 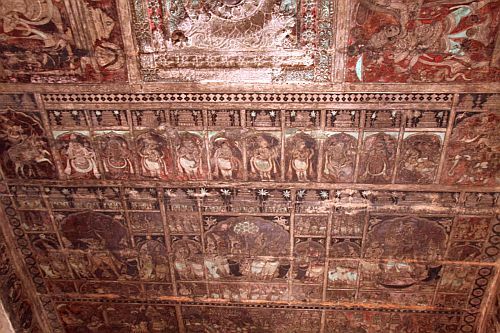 The ceiling of the natya-mantapa have eight panels depicting themes from mythology , such as the manifestations of Shiva- Shiva as Kiratha ( boar hunter), Dakshinamurthy and scenes from Shiva’s wedding with Girija; the scenes from Krishna’s childhood; and the legend of the compassionate King Manu-neethi-cholan who dispensed justice even to animals. 35.4. 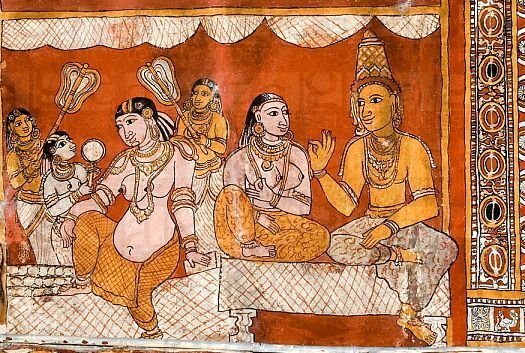 In one corner, the brothers Viranna and Virupanna are shown worshipping Shiva and Parvathi in the company of other courtiers. 35.5. 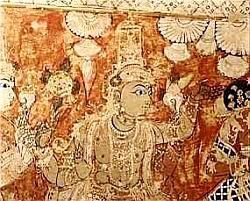 The paintings that have survived are some of the most outstanding murals in India. 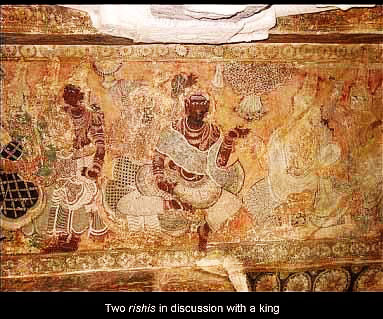 They are also the best among the Vijayanagara style of pictorial art. The drawings are eloquent, natural and full of vitality. The sense of liveliness is enhanced by the depiction of the protruding eye, the angular features and by the peaked corners of clothes. The beauty of line and form; grace and movement too are delightful. 35.6. The narrative panels are framed and structured by bands and beams with textile patterns. 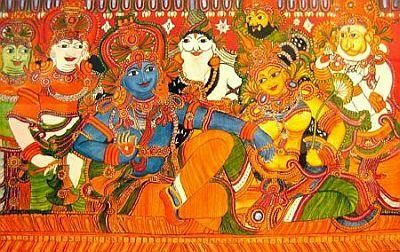 They depict not merely the themes from the epics but also from the contemporary life, bringing to life a variety of costumes, textile patterns, jewellery, headgears etc..
35.7. 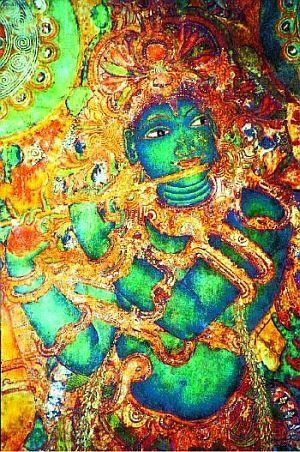 The Lepakshi paintings have continued to influence generation of artists. It is practiced, even today, as a craft. 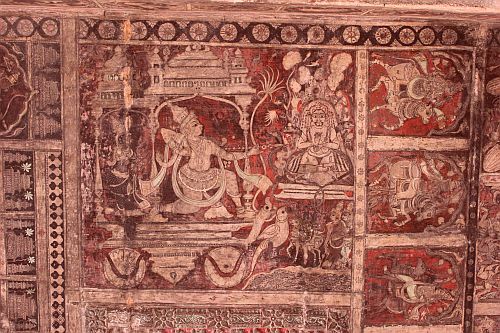 The birds, beasts and foliage depicted in its paintings and sculptures have spawned a style that decorates the block-printed Indian textiles and rugs; popularly referred to as the Lepakshi motifs. 35.8. The paintings provide a glimpse of the richness and colour of a cosmopolitan society; its styles and fashions. 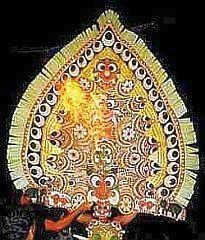 The costumes of men and women, colour and embroidered sarees, jewellery, hair styles , tall headwear (kulavi) etc. now serve as a resource for the textile and fashion designers, as they provide details of costumes etc of a distant past . [ The conical –headgear of those times named Kulavi has an interesting sidelight. 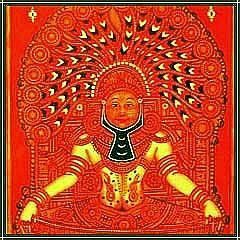 A lot has been written about Kulavis by the scholars in Indian history. For instance, there is a theory that the Pallavas who first established their kingdoms in the upper regions of the Krishna river during the third century and extended it up to Kanchipuram, further down south, by around fourth century ; and ruled over large parts of south India till about ninth century , were immigrants from north. 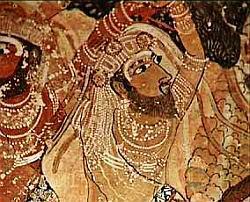 One of the arguments in support of that theory is the tall conical headgear worn by the early Pallava kings, which resembles the typical cylindrical Iranian head-dress. Until the British took root (by 1857), the idiom of administration in India was Persian. The elite conversed and recited poetry in Persian; they dressed in Persian style; and the official language of the kings’ offices, courts etc. was Persian. A number of terms in present-day India’s revenue administration are derived from Persian. 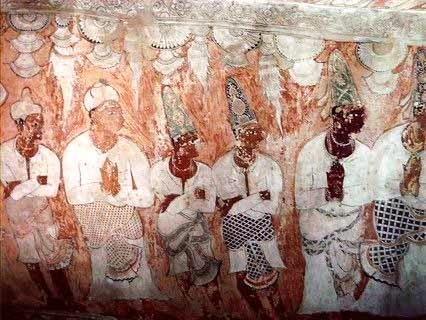 The wealthy traders and the officials of the king’s court during the vijayanagar times (16th century) too perhaps dressed in Persian style, as depicted in the Lepakshi murals. Another interesting observation about the conical cap is that the most famous idol of Balaji (Sri Venkateshwara) atop the shrine at Tirumala – Tirupathi hills is adorned with an eighteen inch tall cylindrical crown . And, it is never taken out; the head-priest alone is authorized to change it and that too in strict privacy. 39.1. 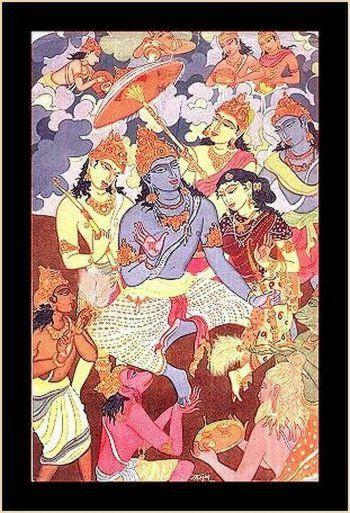 Brigitte Khan Majlis, Cologne; has done a wonderful study of “the Fashion and Textile Design in the Murals of Lepakshi”. It is highly interesting; please see the view the accompanying pictures (plates). 39.2. She says, “The costumes worn by the figures in the paintings demonstrate that distinct costume pieces and headgear were worn according to gender and status. The textiles show a wide spectrum of patterns. Some of them bear a close similarity to extant cotton textiles, produced along the Coromandel Coast for export to Indonesia in the 17th and 18th century”. 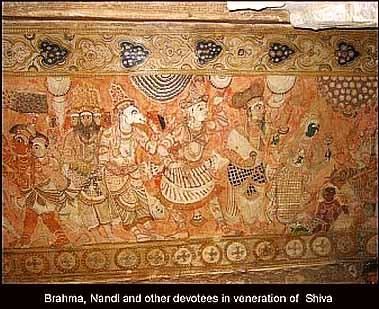 Further, while researching into the textile fashion designs depicted in the Lepakshi paintings, Brigitte Khan Majlis says she was overwhelmed by the abundantly decorated textiles gracing the figures of the narrative panels. And, was impressed by their display a wealth of garments, jewellery and accessories of fashion. 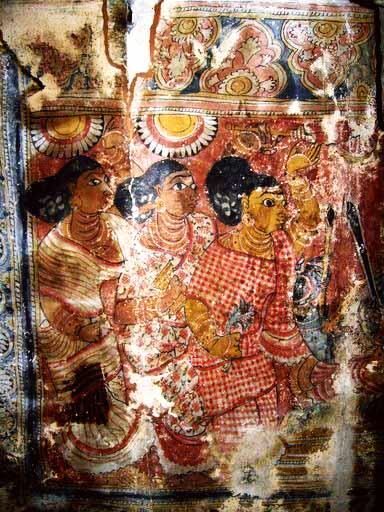 She remarks that the textile patterns in the pictures seem to be sufficiently detailed to take them as examples of real textiles; and connect them with possible textile techniques. Please take a look at a few of her presentations. 39.3. 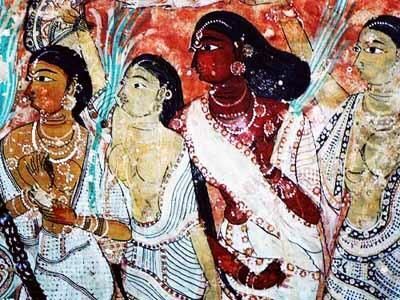 The women’s upper body is bare except for jewellery or in one case a breast band worn by Parvathi. Sometimes the upper part of the fabric is draped in such a way, that it conceals the bosom. The lower end of the fabric is pleated and tucked in at the waist. Like this it fans out in a “fishtail” manner and in fact this appearance has given this kind of sari wrap its name. Most of the sari fabrics appear to be white with stripes or chequers as ornamentation or a band of blossoms along the borders. Some of the material is very fine displaying the outlines of the legs. 39.4. 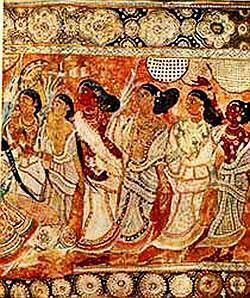 Even today, the chequers and stripes are a choice ornamentation of saris and other textiles in South India. 39.5. 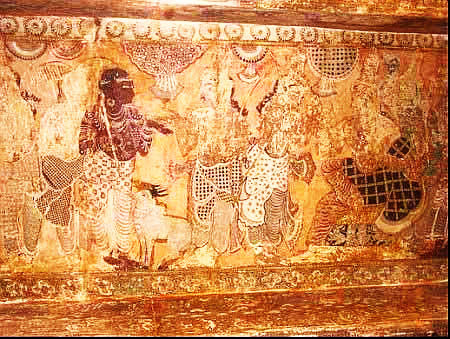 Male attire: The paintings reveal quite accurately how the pleated part of dhoti was pulled between the legs and tucked in at the back. The dhotis are usually rather plain, white with stripes, tiny dots or of a chequered material. A second more ornate hip cloth was worn atop of the dhoti, encircling the hips at least twice, with the ends flowing gracefully in the air or one part tucked in under one arm in a big loop. A third cloth could be wrapped diagonally across the upper body or around the neck. 39.6. However there are some personages among the paintings which represent actual people of political status. [This is the Eighth article in the series. 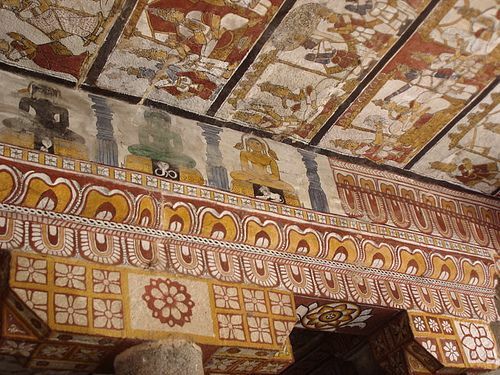 The present article is about the murals painted on the high ceiling of the ranga-mantapa (the hall) at the Sri Pampa Virupaksha temple, Hampi (Karnataka).The 15-16th century art and architecture in Hampi represents the flowering of the Vijayanagara School. 28.1. 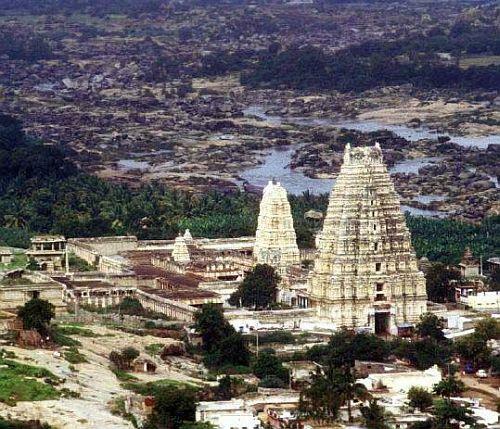 The temple of Sri Virupaksha at the foot of the Hemakuta hills, along the southern bank of the Tungabhadra, is the oldest shrine in Hampi; and it is still in active worship. 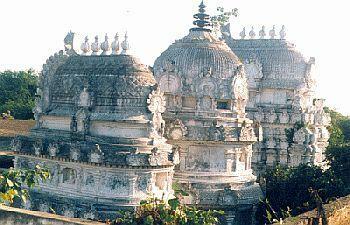 It is a shrine dedicated to Lord Shiva who is addressed and worshiped here as Pampapathi and Virupaksha. Its towering Gopura stands tall and alone amidst the ruins of Vijayanagar, the forgotten empire (1336-1565). 28.2. 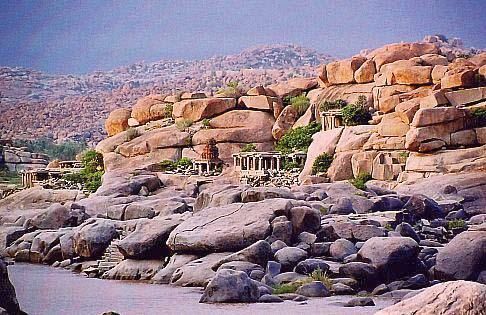 The earlier name of the river Tungabhadra that meanders through the rocky terrain of the ancient ruined city was the Pampa. And, the lake nearby was Pampa–sarovara; and the area surrounding the river was called Pampa-kshetra (the region of Pampa). 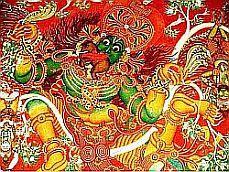 The Lord of this kshetra, the sacred space, is Pampapathi. 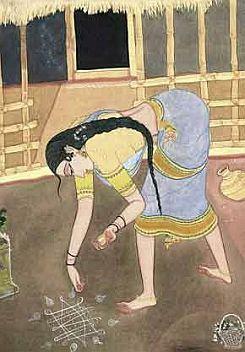 The Pampa is also identified with Parvathi. 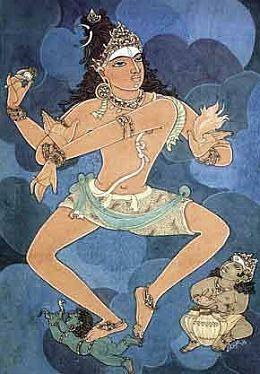 Thus, Shiva, in either case, is Pampapathi the Lord of Pampa. 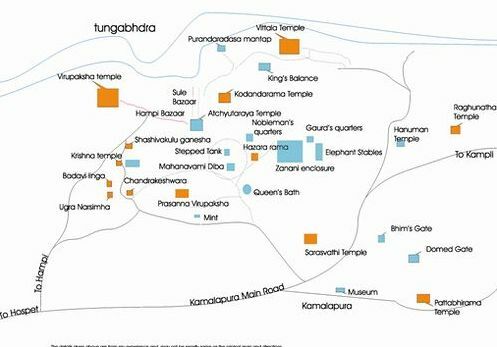 The area around the Pampa, surrounded by amazingly rugged massive boulders and craggy hills of Malyavantha, Matanga and Hemakuta, is identified as the Kishkindha, the capital of the Vanaras, of the Ramayana era. As if to justify its claim to that distinction, the hills are menacingly populated with ferocious long -tailed, dark- faced langur monkeys. 28.3. 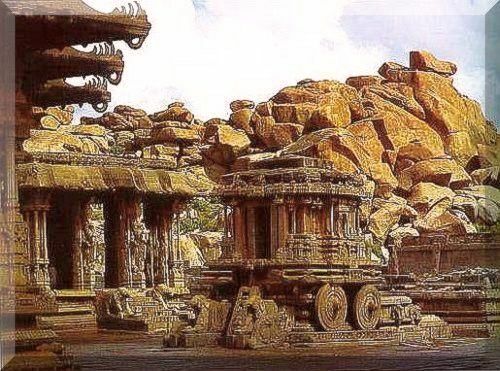 With the establishment of a Kingdom (c.1336) by the Sangama brothers – Harihara Raya (Hakka) and Bukka Raya (Bukka) – the rocky wilderness came to be known as Vijayanagar or Virupaksha-pura (after its presiding deity Lord Virupaksha, one of the many names of Shiva). 28. 4. Hampa is the archaic Kannada name for the Sanskrit term Pampa; and its later Kannada form is Hampe, which eventually got anglicized into Hampi. But today, Hampi, in effect, is the Ruins of Hampi, a UNESCO protected world heritage site .Encased within the amphitheatre of tough and defiant rocky landscape, the imposing 160-foot spire of the Sri Pampa-Virupaksha shrine stands tall overlooking the ruins strewn around it; a magnificent -mute-witness to history, glory and the ruin. 29.1. The Pampa-Virupaksha shrine predates the foundation of the empire over which it came to preside. It is said; the sanctum per se belongs to about seventh century. The inscriptions of 9th-10th centuries suggest that some additions were made to that structure during the late Chalukya and Hoysala periods. The Sangamas rulers (1336-1485) too effected other improvements to the temple. It was, however, during the reign of the Tuluva dynasty (1491 -1570: a dynasty founded by the Tulu speaking Bunts hailing from coastal region of Karnataka) , the modest sized shrine was greatly extended and transformed into a sprawling major temple complex with many sub shrines, pillared halls, flag posts, lamp posts and towered gateways. A narrow channel of the Tungabhadra River was diverted to flow along the temple’s terrace and then led into the temple-kitchen; and finally exited through the outer court. 29.2. The major improvements to the temple, such as the 50 m tall towering eastern gateway (Gopura) and the Ranga-mantapa were added around the year 1510, during the reign of Krishnadevaraya (1509-1529) the most celebrated of the Tuluva dynasty and of the entire line of the Vijayanagar rulers. Inscriptions on a stone plaque installed next to the pillared hall (mantapa) record his contributions to the temple. 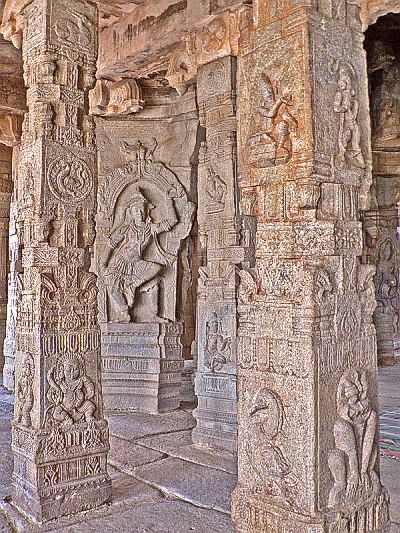 The mantapa is in the Vijayanagara Style of architecture, with its exterior walls decorated with many bas-reliefs and with multi-petalled lotus motif. 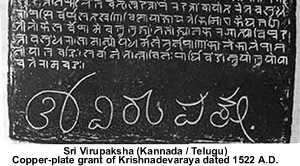 The Kings of Vijayanagar promulgated State orders in the name of Lord Sri Virupaksha ; and , affixed signature to the documents as ‘Sri Virupaksha ‘. 30.1. 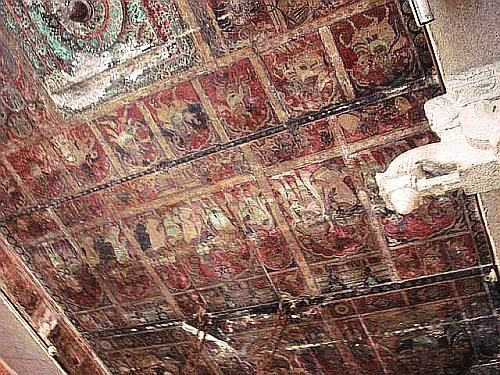 The high ceiling of the Rang-mantapa as also its supporting beams were, at onetime ( early 16th century) , decorated with painted panels depicting themes from the epics as also from events of contemporary life. 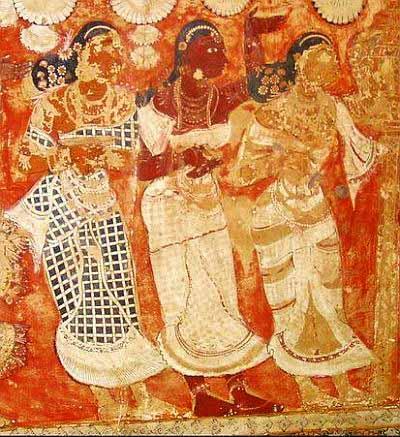 The Vijayanagara style of painting, as it came to be known later, was a combination of the Chalukya, Chola and Pandya styles. The characteristic features of the Vijayanagara art were the simplicity and vigour in their depiction. There was an attempt to capture the sense of movement and energy in the painted figures. 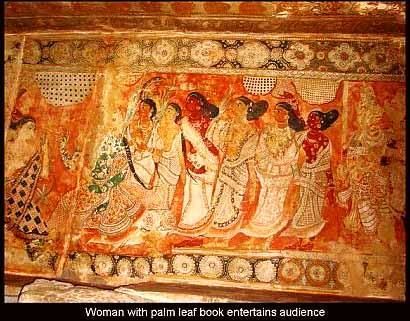 They marked the flowering of Deccan art and culture. 30.2. 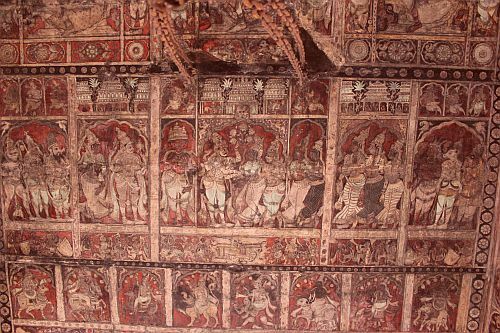 The murals were arranged on the high-ceiling of the Ranga-matapa, within rectangular panels having richly decorated borders. Sadly much of the painted panels have faded away or were destroyed. 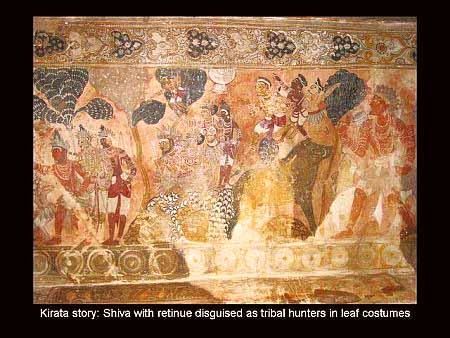 Only the panels on the central portion of the Ranga-mantapa are now visible; and they are the only few remains of the Vijayanagara mural art. 30.3. 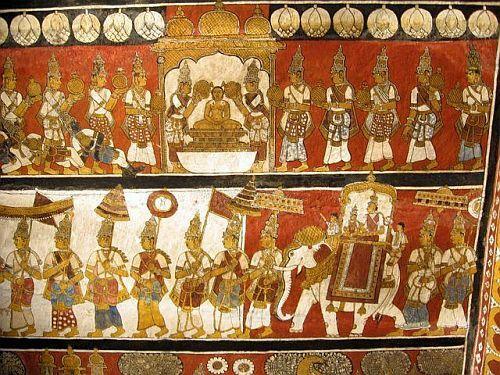 The story of the Vijayanagar Empire and its early kings is intertwined with stories of the Indian epic heroes. Both shared a deep religious belief and an ambition to establish a new and a just world order. The prime impulse for establishing and building Vijaynagara kingdom too was born out of a deep-rooted aspiration to protect and perpetuate the Hindu way of life and its values, the Dharma. The inspiration for that bold initiative was provided by the founders’ preceptor Guru Sage Sri Vidyaranya. 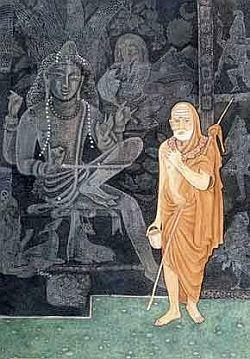 He was the 12th Jagadguru who presided over Sri Sharada Peetham at Sringeri (Karnataka) from 1380 to 1386 A.D.
30.4. 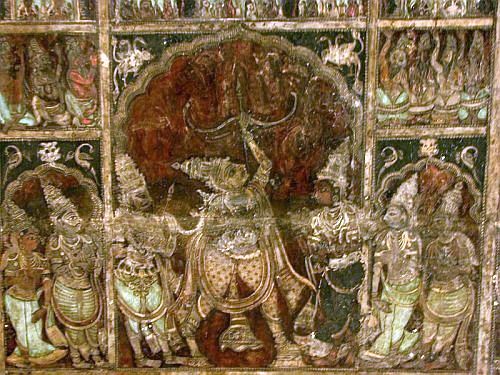 The glory, the virtues, the valour and the deeds of the gods and the epic heroes, naturally, formed the subject of Vijayanagar art. 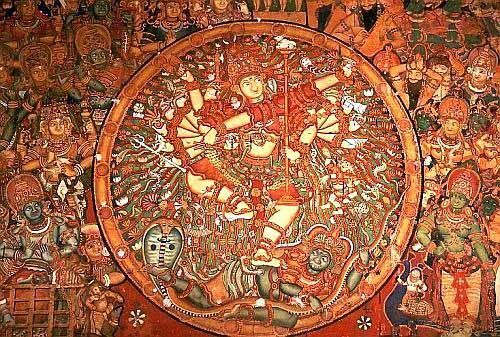 Those themes were depicted with pride, devotion and great skill in all Vijayanagara sculptures and paintings. 30 .5. 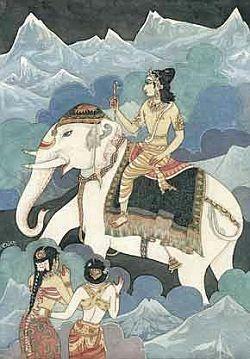 The themes depicted in the paintings were mainly from the puranas and the epics. 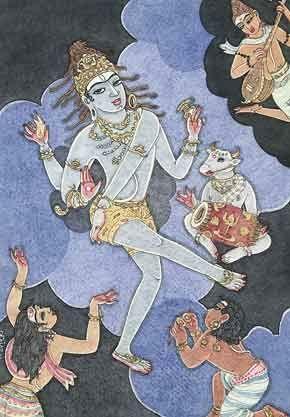 They include several of Shiva’s manifestations (Kamadahana-murti and Tripurari); Girija-kalyana (Girija’s wedding with Shiva); the ten incarnations (Dashavataras) of Vishnu; the figures of the Dikpalas (the protectors of all directions/regions); as also the classic scene of Arjuna shooting the fish device (matsya yantra) to win Draupadi’s hand in marriage. 30.6. 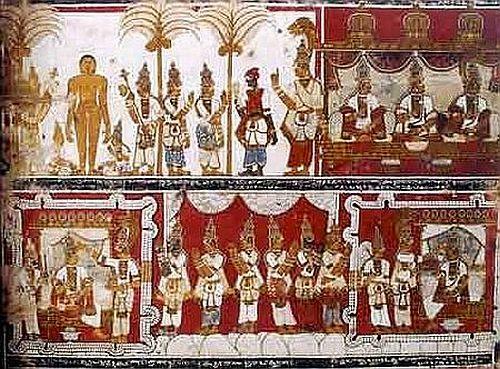 Along with the epic themes, there is also a scene depicting Sri Vidyaranya the spiritual founder of Vijayanagar being taken in procession. Some scholars say, the founders of the Vijayanagara submitted the new- kingdom to their Guru, Sri Vidyaranya, of the monastery at Sringeri, as an act of intense devotion and gratitude. 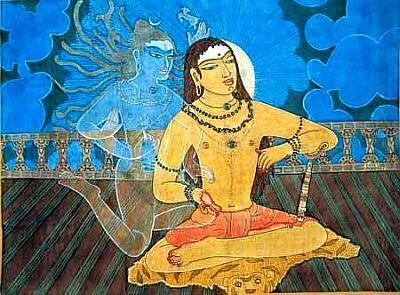 Sri Vidyaranya was thus the de-jure king ; and the State, in its early stages, was administered in his name. 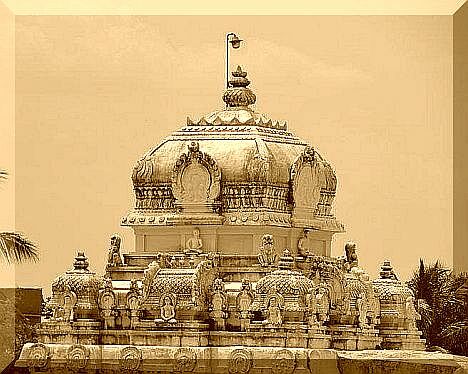 It is because of that tradition, it is said, the Gurus of Sringeri are entitled to the royal prerogatives of a throne, sceptre and crown.It is in practice, even to this day. 30.7. 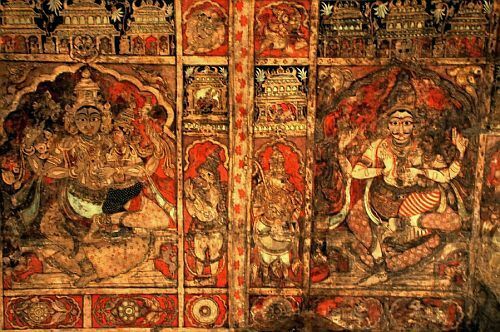 The Sri Vidyaranya panel is one among few in traditional Indian art, which depict scenes from contemporary history. The panel extant on the temple ceiling has, sadly, become old and hazy. 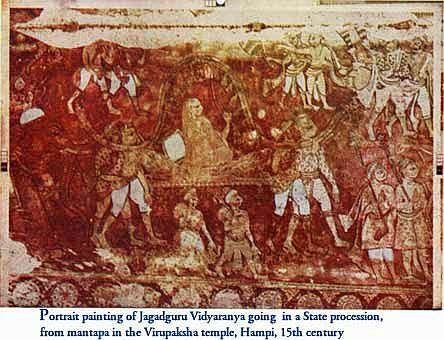 It depicts the scene of Sri Vidyaranya seated in a palanquin and taken in a procession. The sage is seated in a decorated palanquin with a backrest carried by four bearers ; followed by several men on foot weaving chowries (fly-whisks) or carrying long knotted staves. 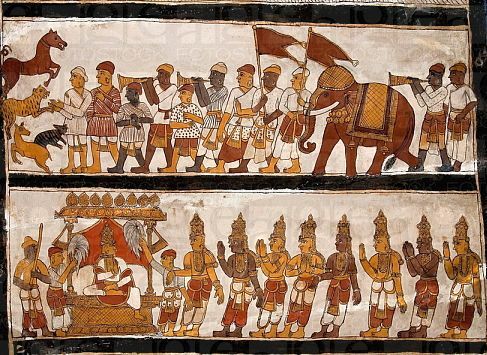 The long procession is led and followed by decorated elephants. The tilt of the palanquin hinted movements negotiating the uneven ground-surface. The portrayal is one of grace and rhythm; and there is an air of calm and respectful silence in reverence to the Guru. 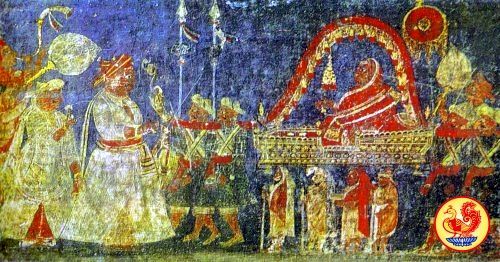 There is another painting (dated around 15th century) which depicts Sri Vidyaranya seated in a palanquin (adda-pallaki) and carried in procession , with the Kings of Vijayanagar attending on their Guru. 31.1. As regards the technique adopted, it was seeco technique where a surface was prepared with three or four layer of plasters and finally with a crystal soft lime plaster or the paste of the conch shells. Then, sketches were made on the smooth surface of dried plaster. 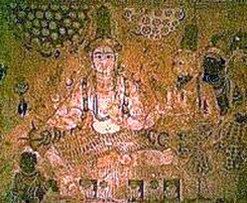 This method of preparation of the surface was much different from the one adopted by the artists of Ajanta, which was more elaborate and spread over a much longer stages of preparation. 31.2. The sketches were made in red ochre; and the colours of the paints used were delicate and sometimes soft and smoky. Only three or four colours were used; and they were mostly earthen and sometimes mixed with glue or any other vegetable binders. The background was usually in red and the figures were in lighter tones are blue. 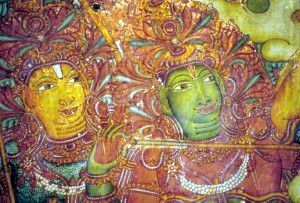 We shall look at the paintings at Lepakshi (Andhra Pradesh) which represent a much advanced stage of the Vijayanagara School of art.